Welcome to the new year. 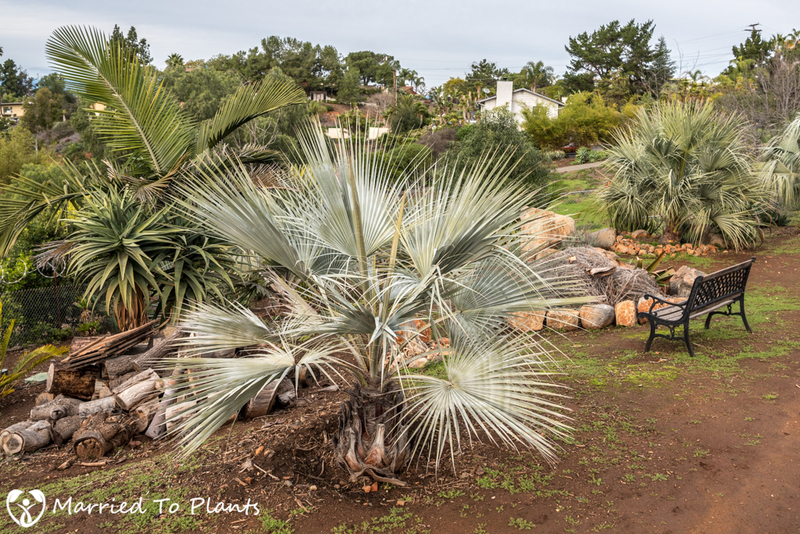 Welcome to Bob’s garden. 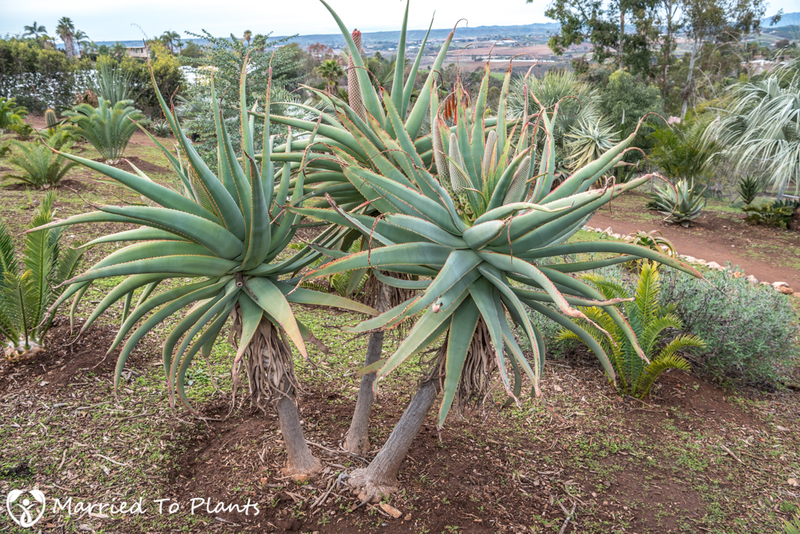 Last year I wrote a post about aloes, with a spotlight on hybrids. 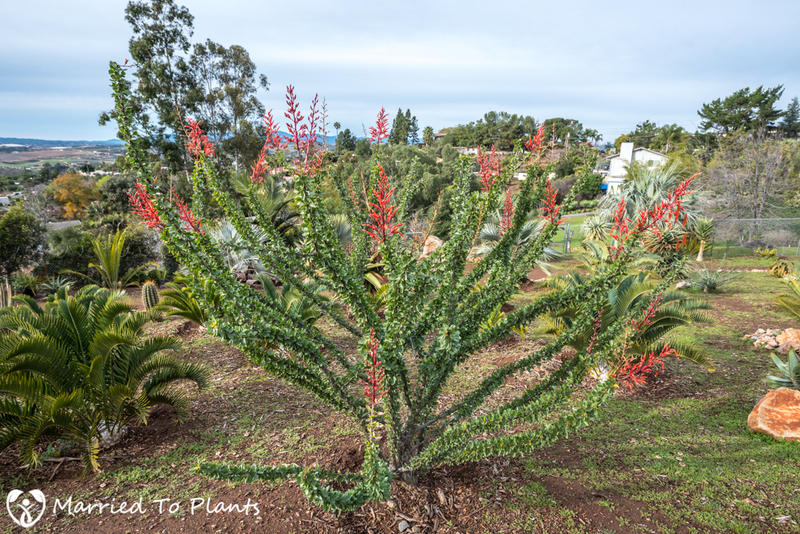 Those plants were all from the exceptional garden of Bob De Jong. 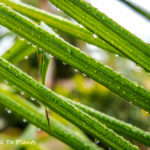 That post received a lot of positive feedback and came with many private requests to see more. 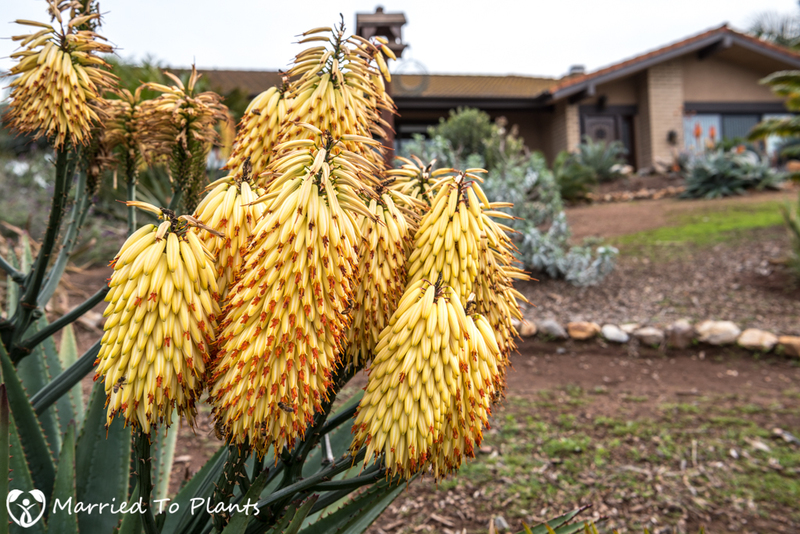 Wanting to oblige, I have waited until Bob’s aloes were once agin flowering to do a more in-depth writeup on his garden. Today is that day. 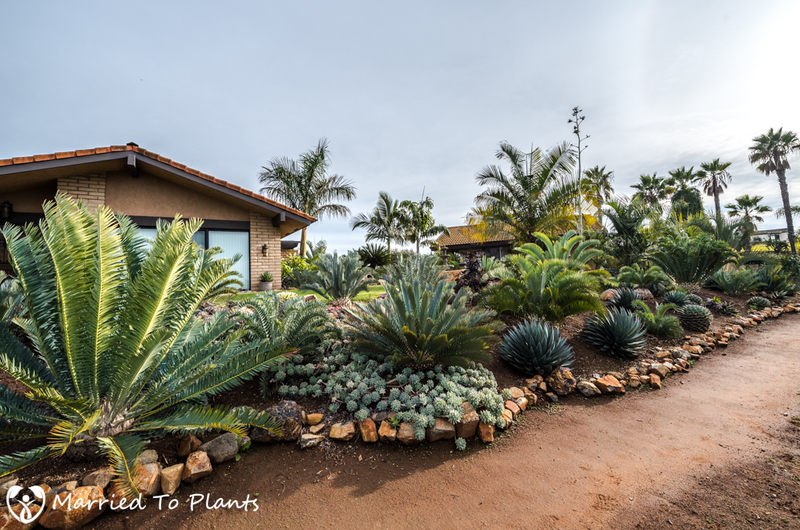 When you look at all these photos (80, to be exact), you first need to know that Bob didn’t buy his house or start his garden until July of 2012. 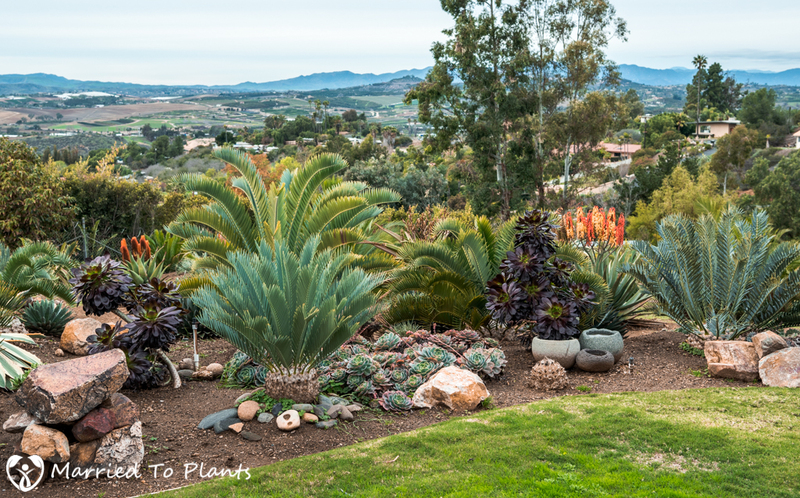 That means in just four short years Bob turned a tired landscape into the exceptional garden you see here. 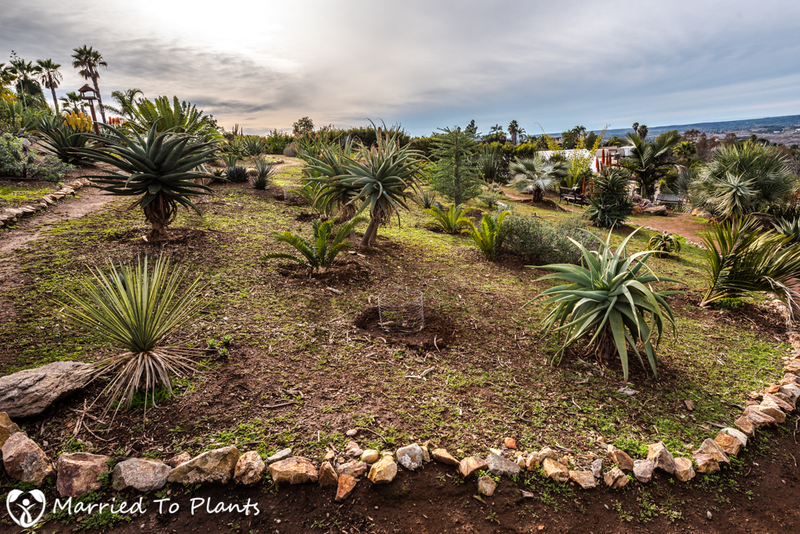 Hundreds of aloes, cycads and agave have been planted. 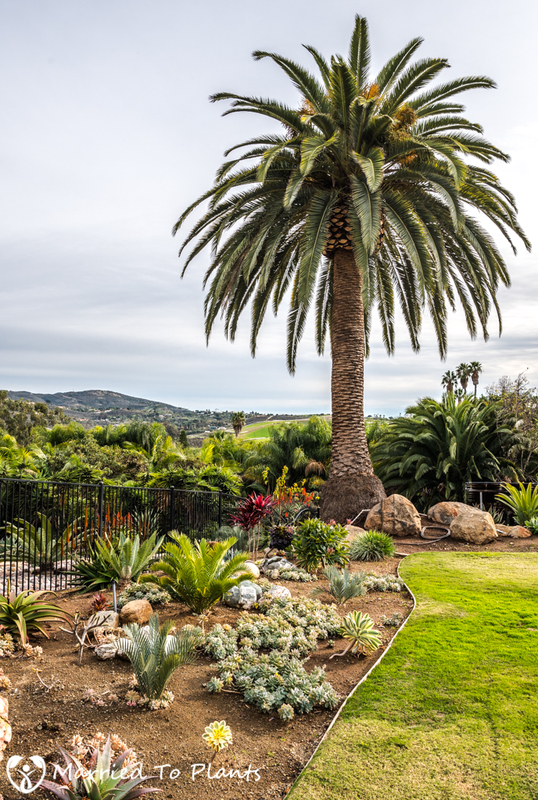 Bob owned a very famous palm garden in San Clemente, CA, that he spent 30+ years perfecting. 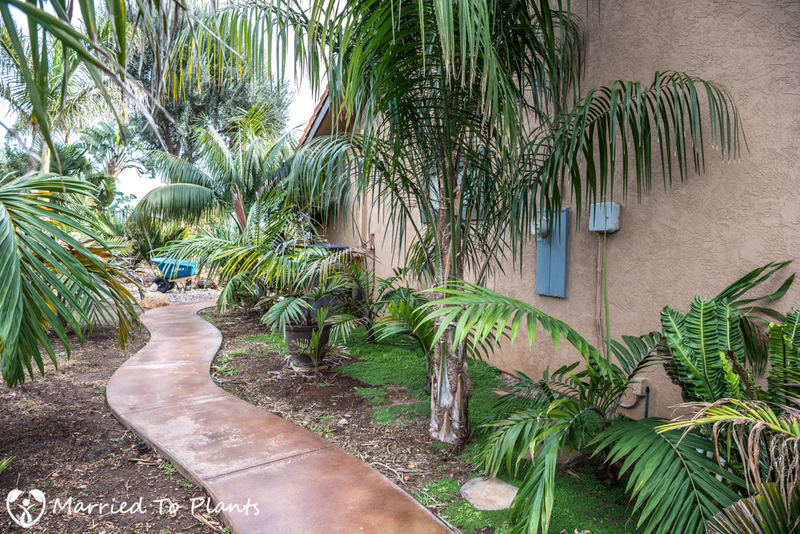 So yes, Bob has palm trees planted too. 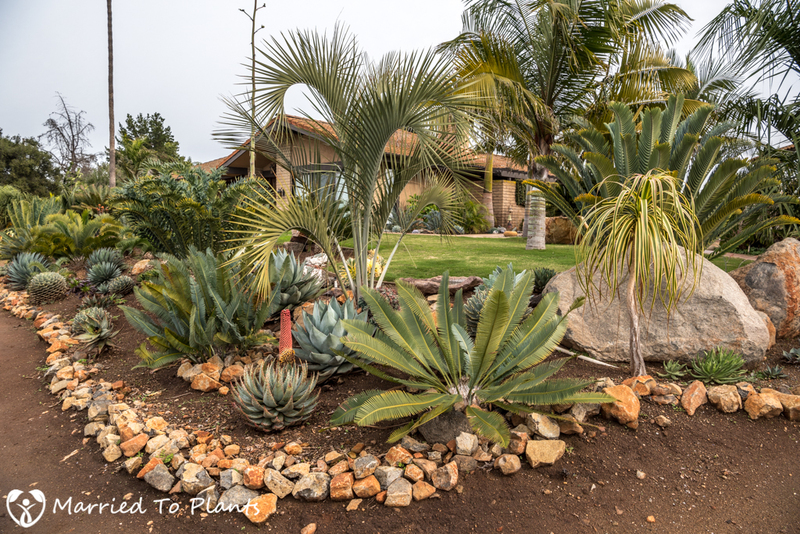 Bob has intertwined all these plants in a very engaging way, with each area of his garden being just a little different to entice you to see what is around the next corner. 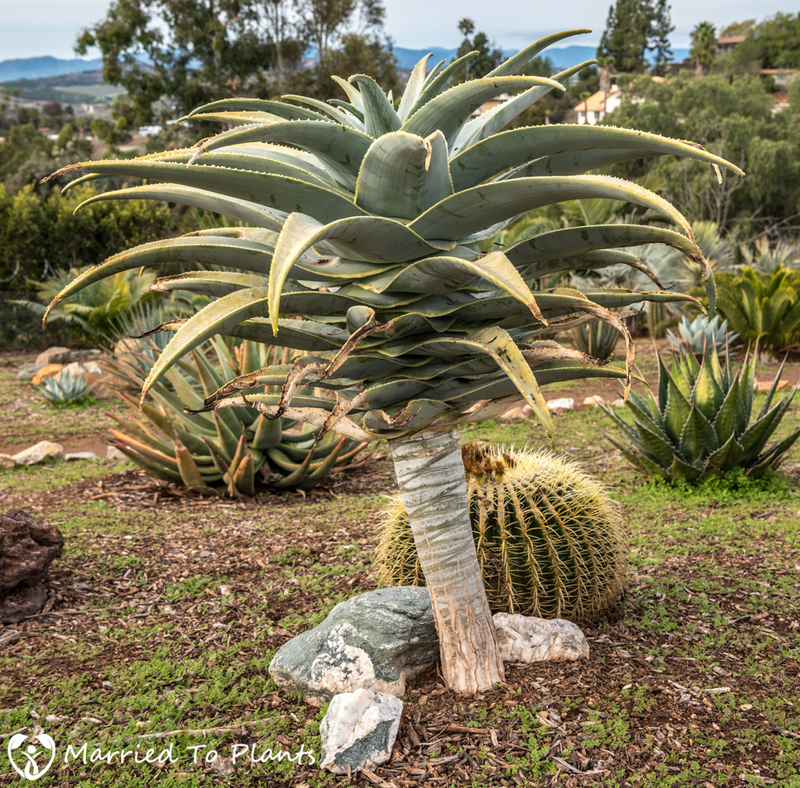 Let’s look at individual plants in his impressive collection. 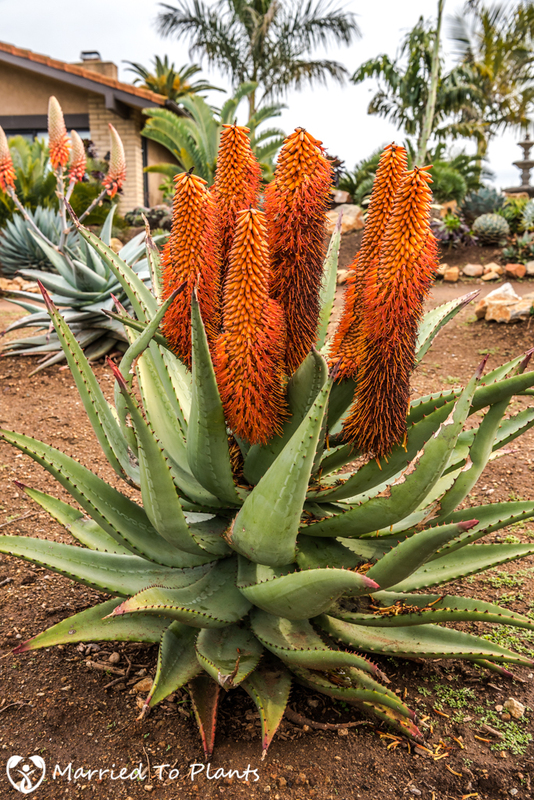 Since winter is the time of the aloe, let’s start with those. 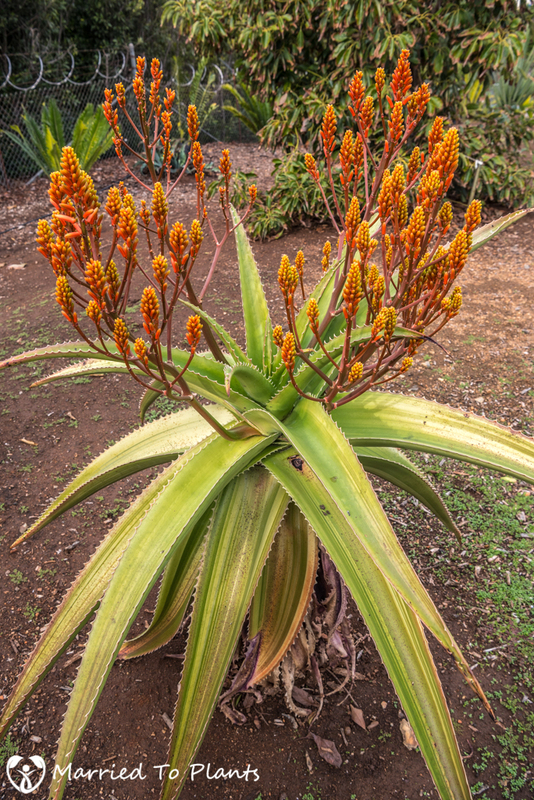 First up is Aloe socotrina. 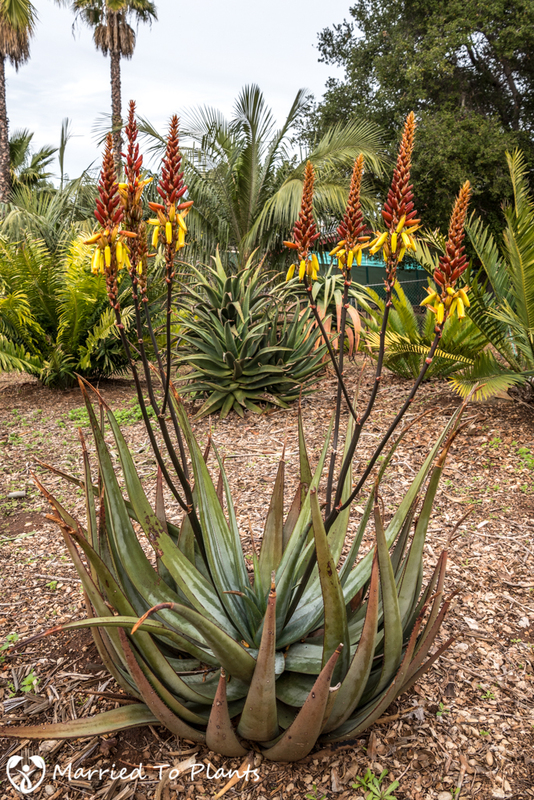 This is an unknown Aloe wickensii hybrid. 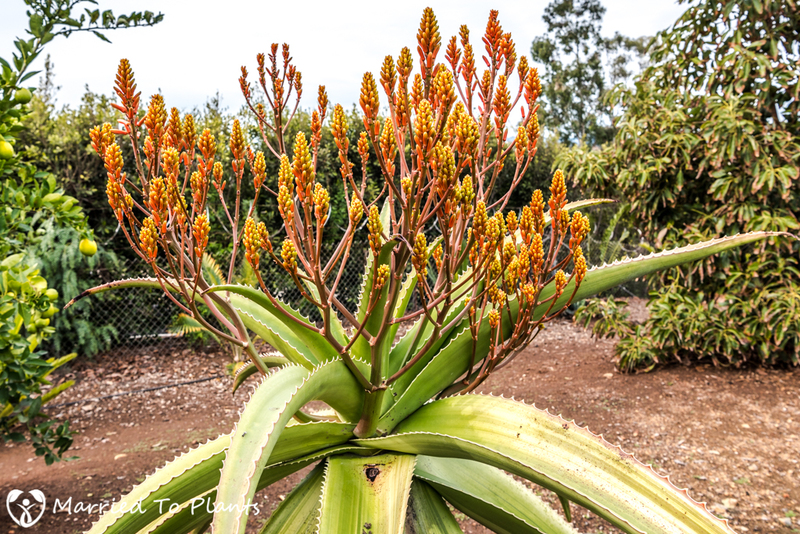 Just a few weeks early for Aloe speciosa flowers. 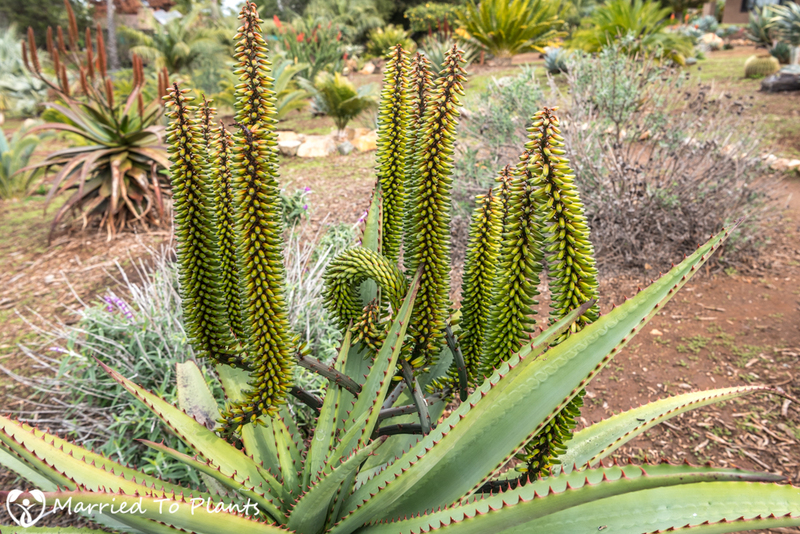 These four flower spikes on one Aloe speciosa prove it will be a great flowering year. 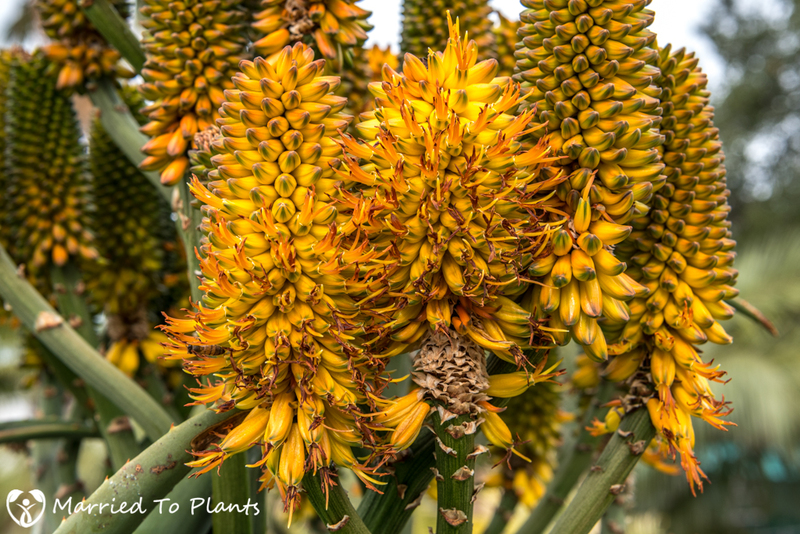 I was early for Aloe ‘Erik the Red’ as well. 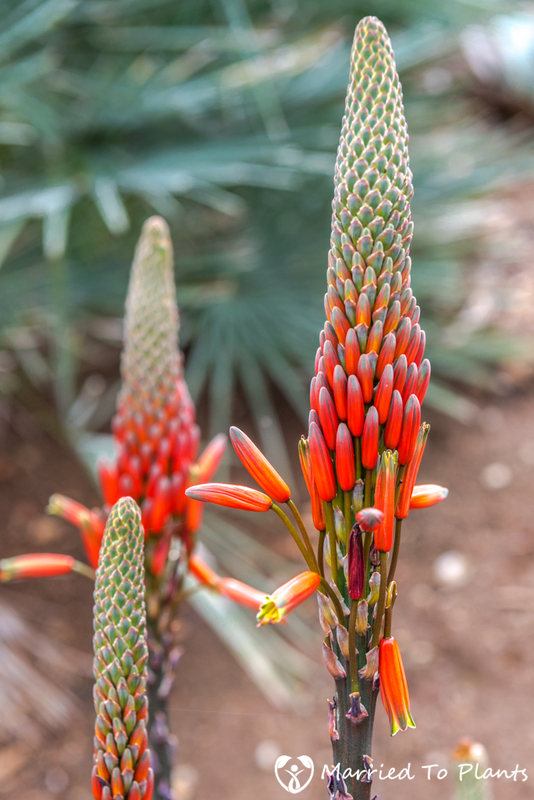 In a few days these flowers will be a stunning bright red. This is some unknown hybrid. 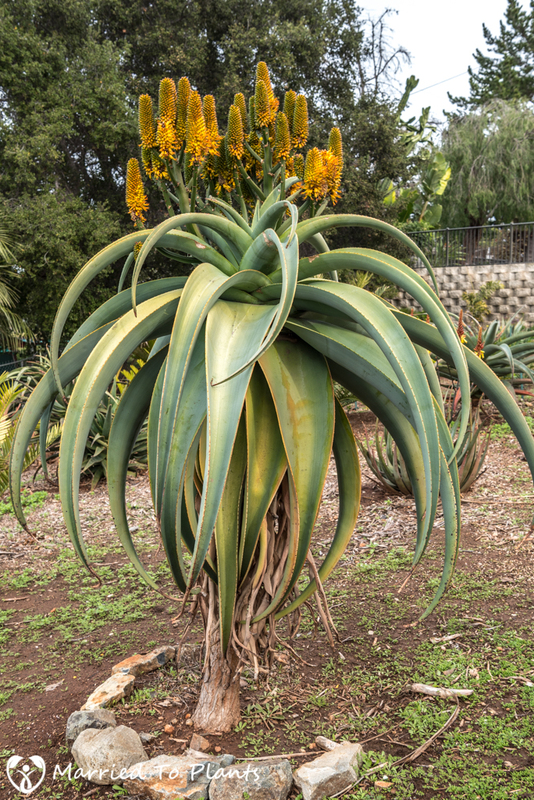 Next are two forms of Aloe capitata. 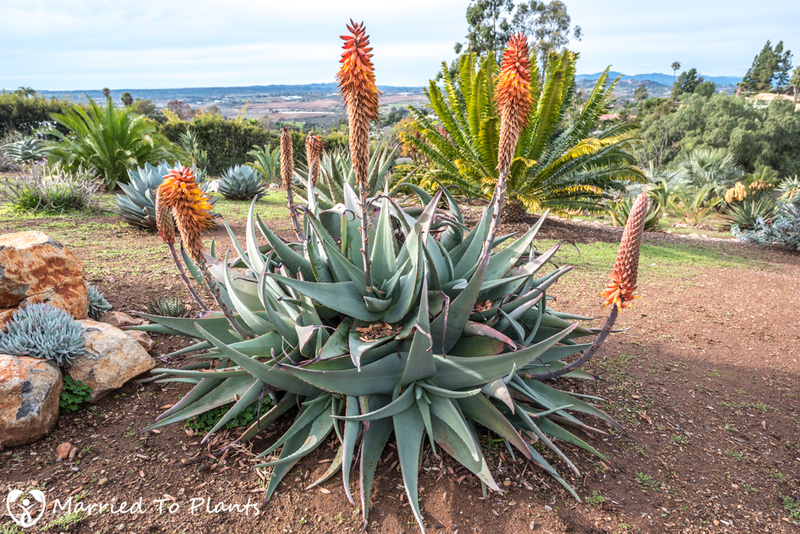 The first is Aloe capitata var. 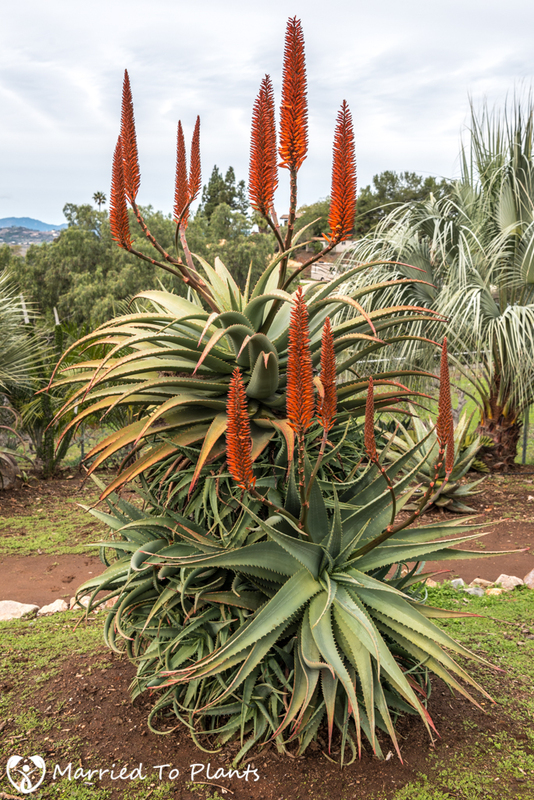 gneissicola and the second is Aloe capitata var. cipolinicola. 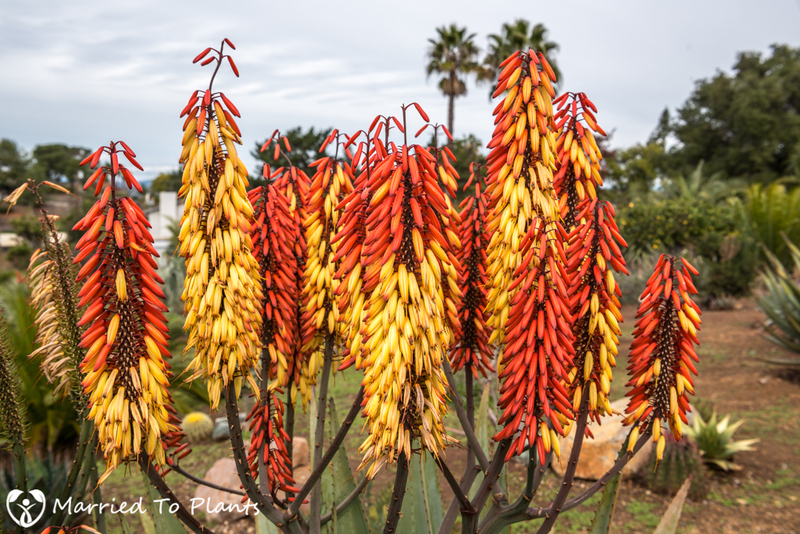 An orange-flowering Aloe ferox in bloom with a white flowering one pictured below it. 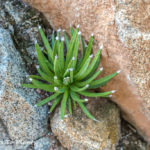 The “white” is more green in that plant and is still a few days from fully opening up. 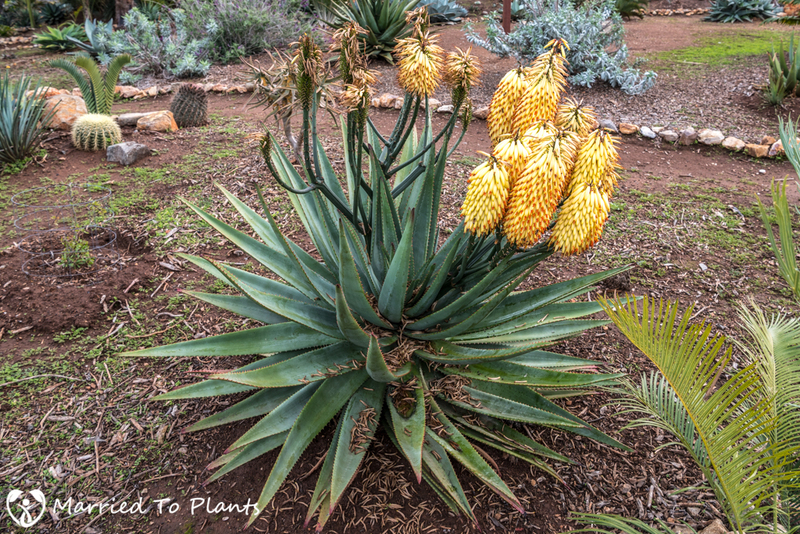 To me this is one of the few aloe hybrids that improves upon the individual species. 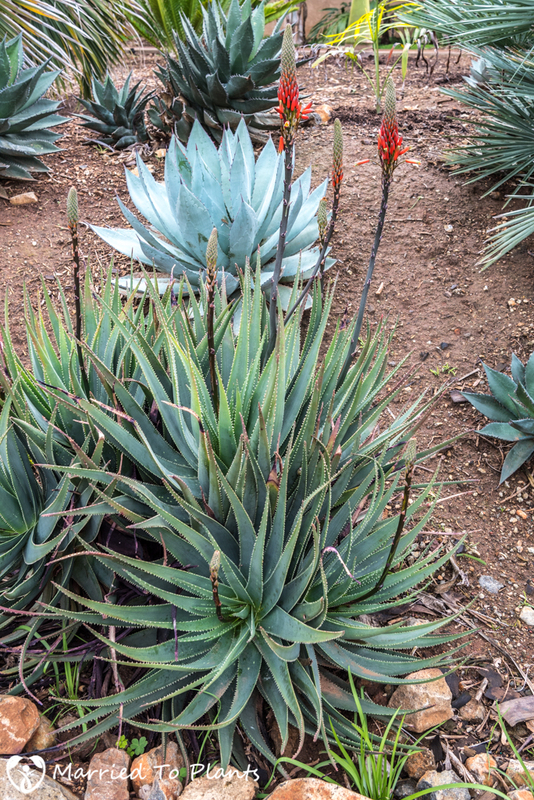 These are Aloe capitata x ferox. 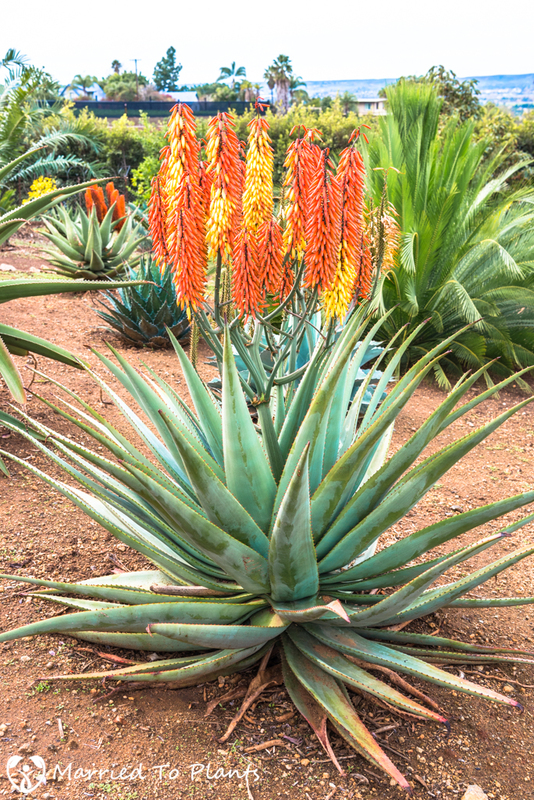 They are a large aloe that have impressive flowers thanks to the amount of racemes and the richness of color. 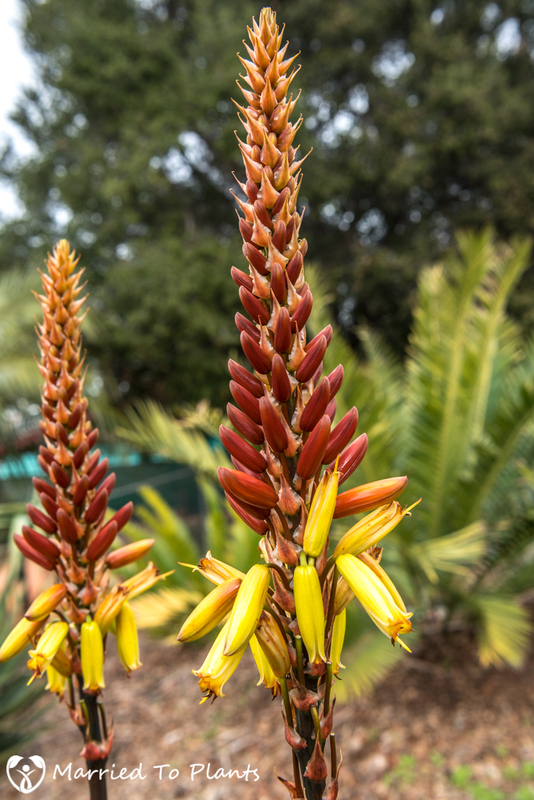 This Aloe capitata x ferox starts out with a bicolor flower. 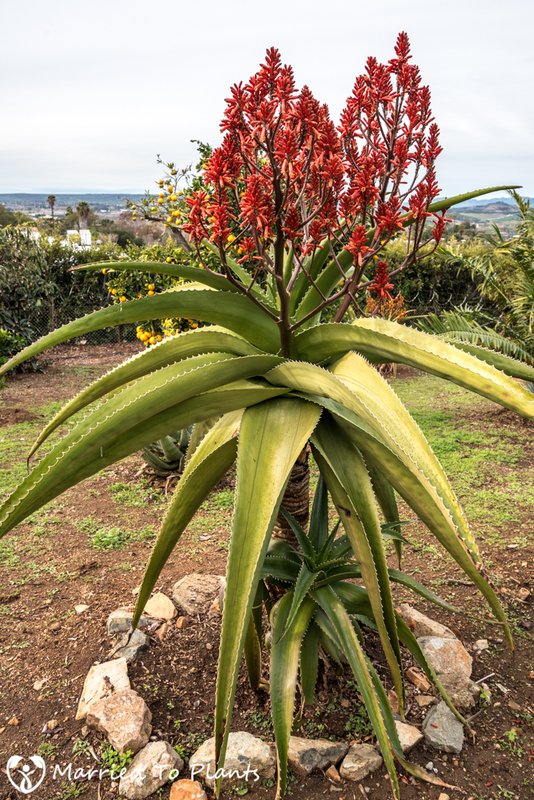 Bob also has two variegated Aloe vaombe in his garden. 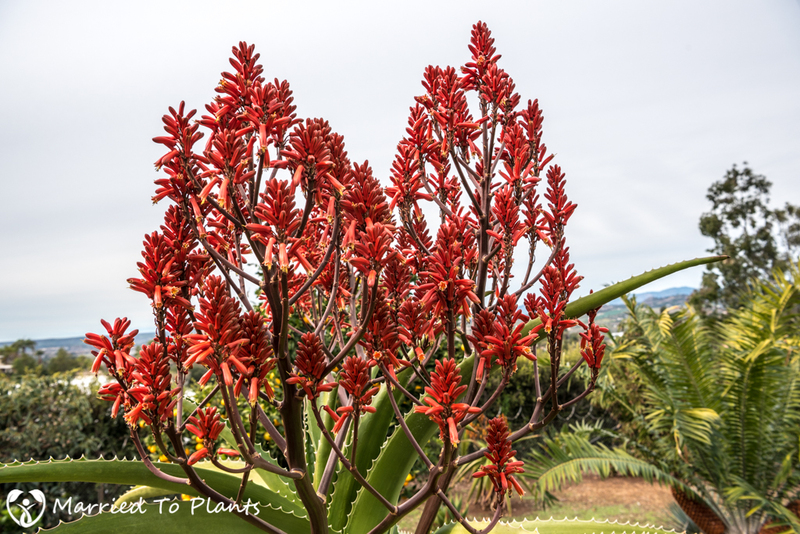 One is the more standard red found in Aloe vaombe, while the other is more of an orange-red. 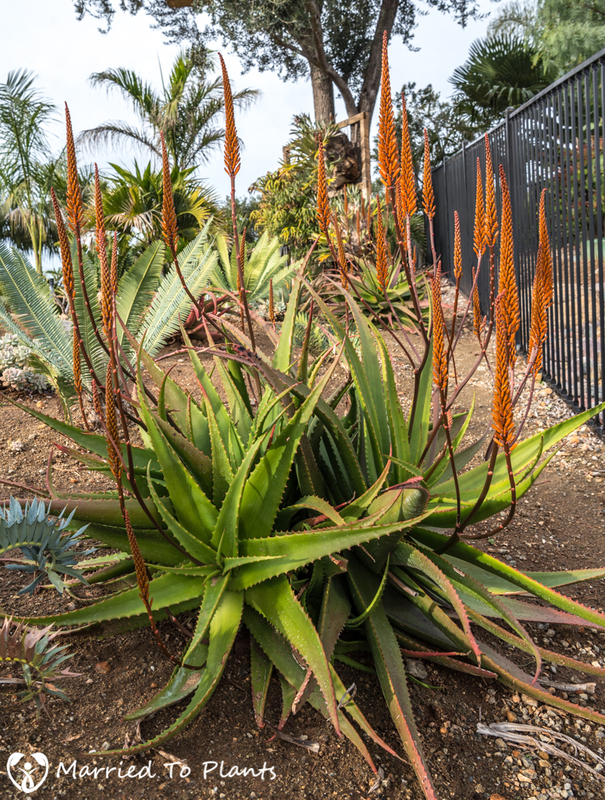 Aloe divaricata is a great-looking aloe but has an unremarkable flower. 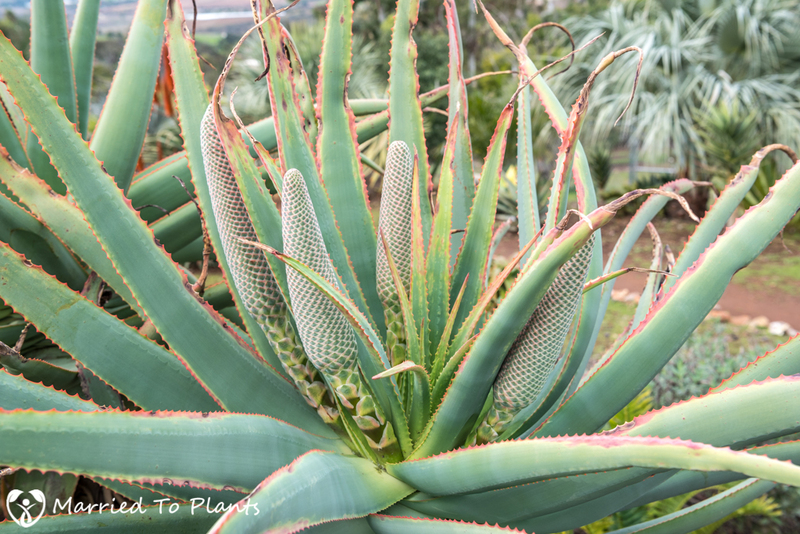 Even though it felt like all his aloes were in bloom during my visit, that wasn’t the case. 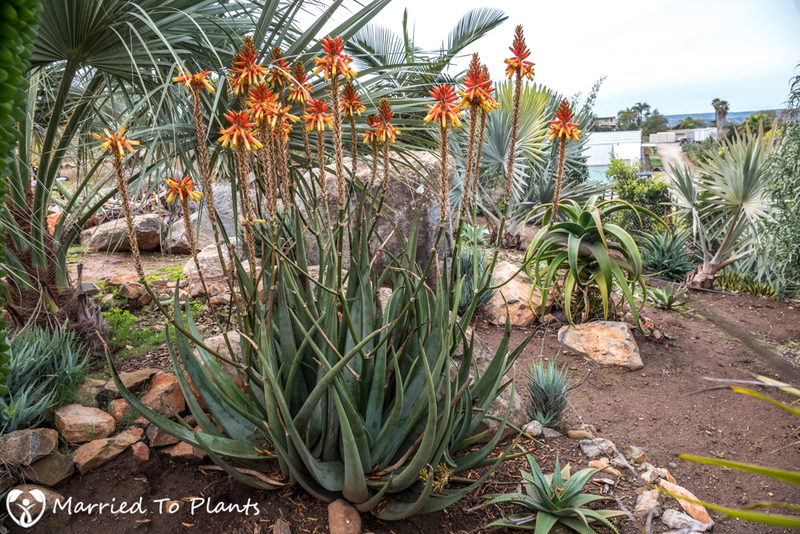 But don’t hold it against Bob, aloes like Aloe suzannae and Aloe pillansii take a while to mature to flowering size. 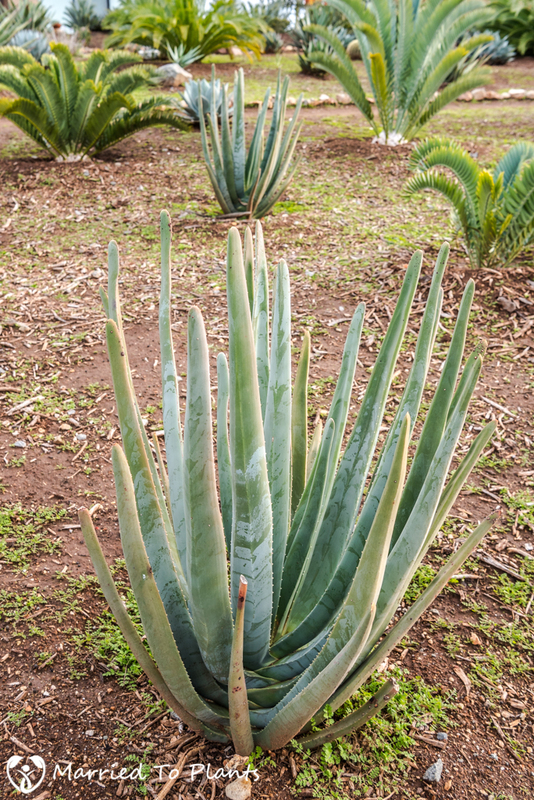 When discussing agaves in a garden, they inevitably lead to interesting debate on whether they should have a place. 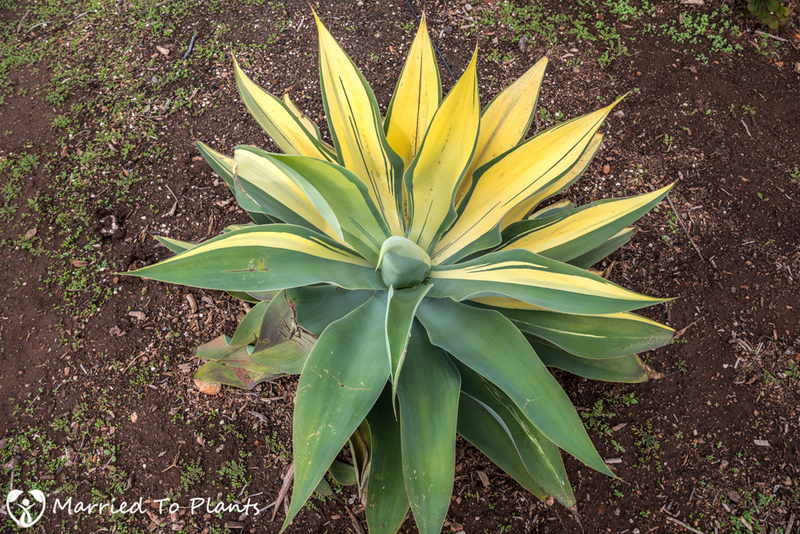 Some are scared off by the pain they bring into the garden for the careless. 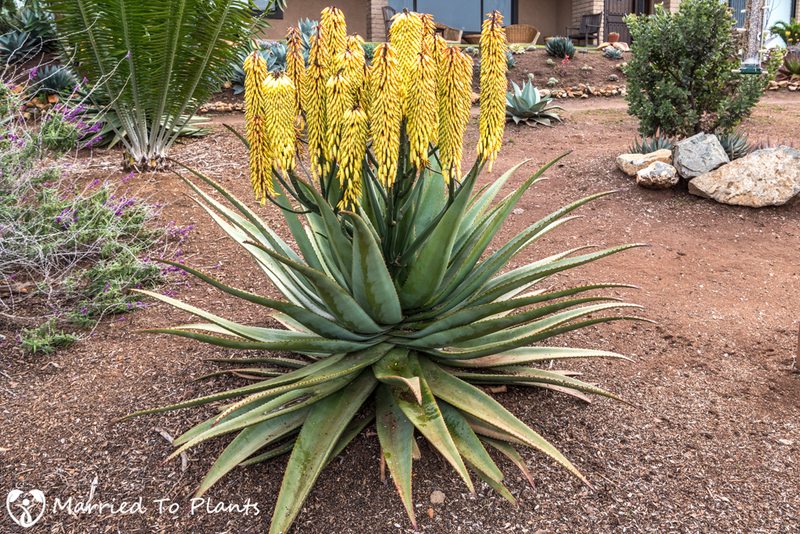 Some dislike them because they can run all over your garden if one slacks on maintenance. 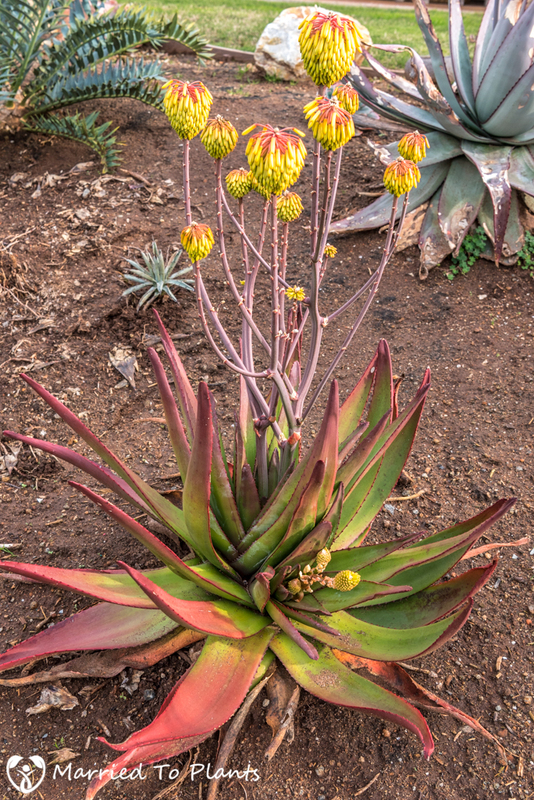 Others find they grow too large where other succulents can provide a similar look. 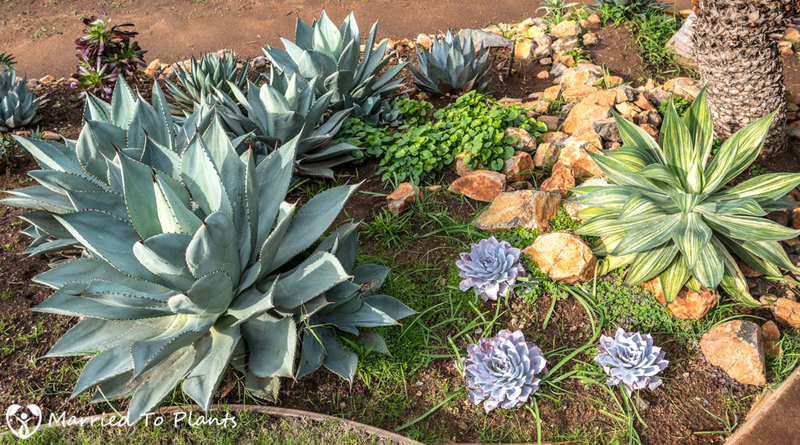 Personally, I couldn’t imagine a California garden without them. 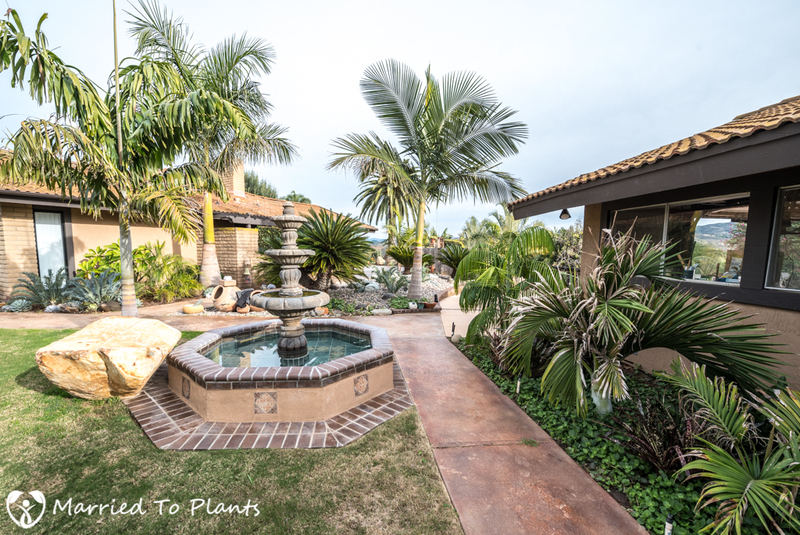 Bob’s yard shows that with careful selection and placement, they add tremendous value to any garden. Debate over. 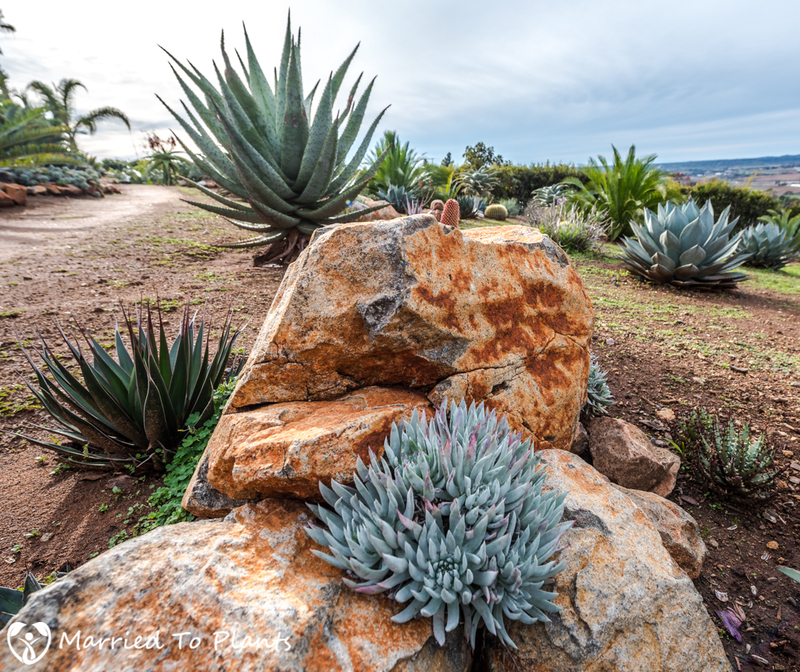 Agave pygmaea (left) and Agave ‘Blue Flame’ Streaker. 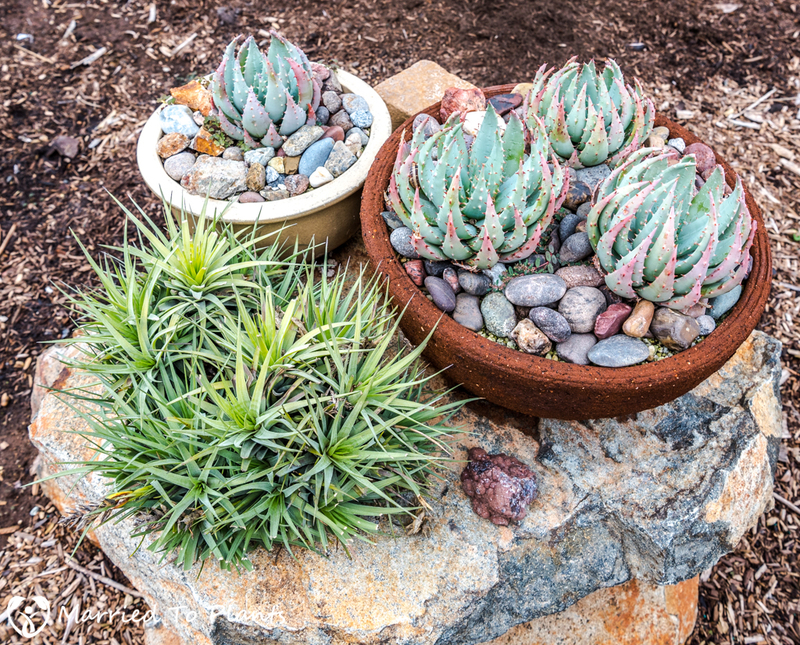 The three bright-colored succulents in between are Echeveria cante. 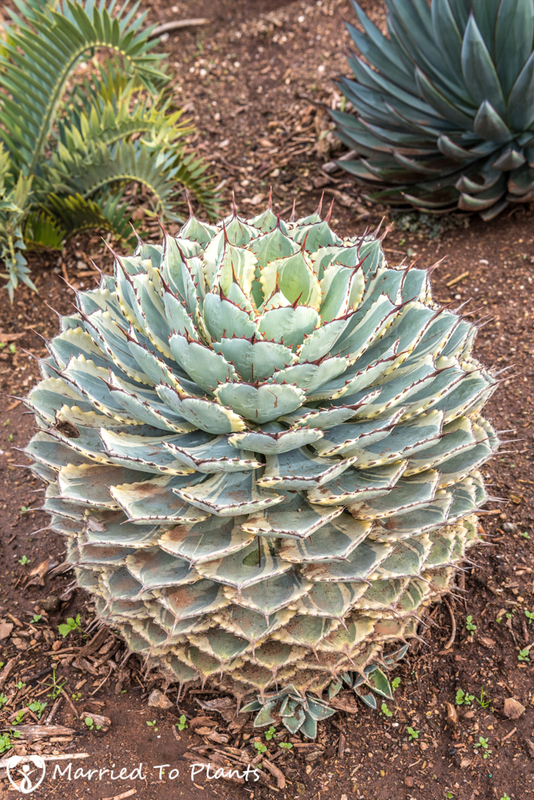 Closeup of Agave ‘Blue Flame’ Streaker. 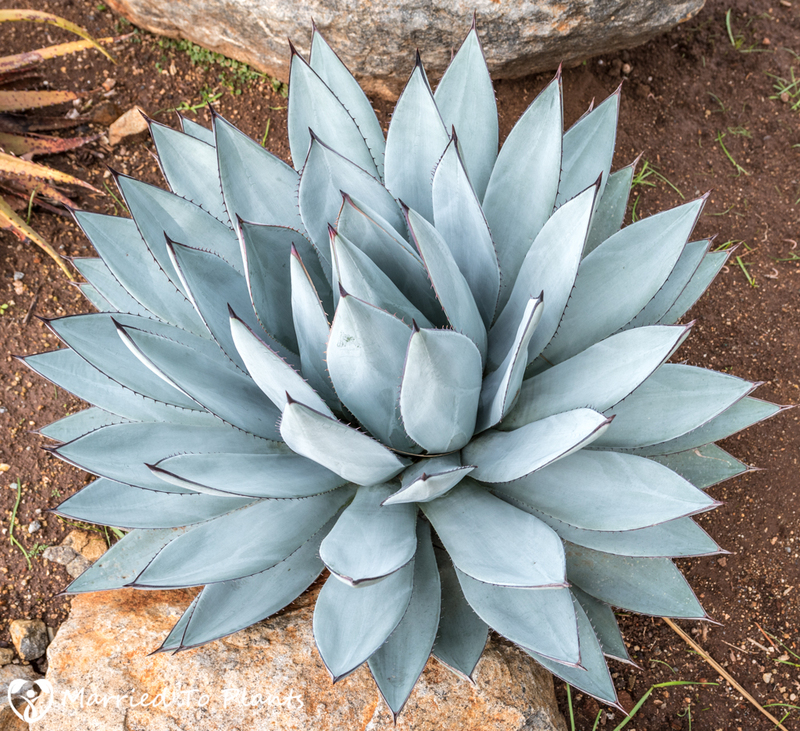 This is a more difficult plant to grow than the standard Agave ‘Blue Flame.’ It is slower, more prone to rot, and appears to be more cold-tender. 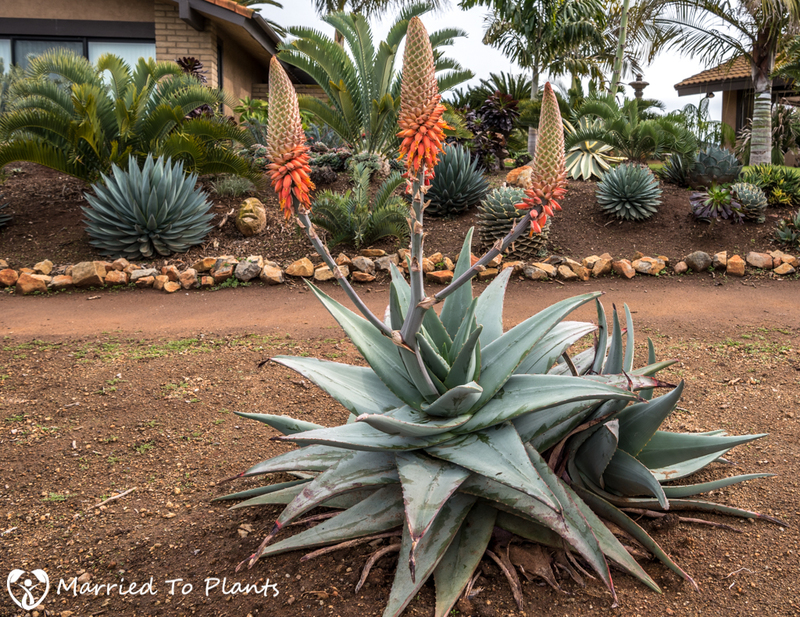 Bob’s is grown to perfection, however. 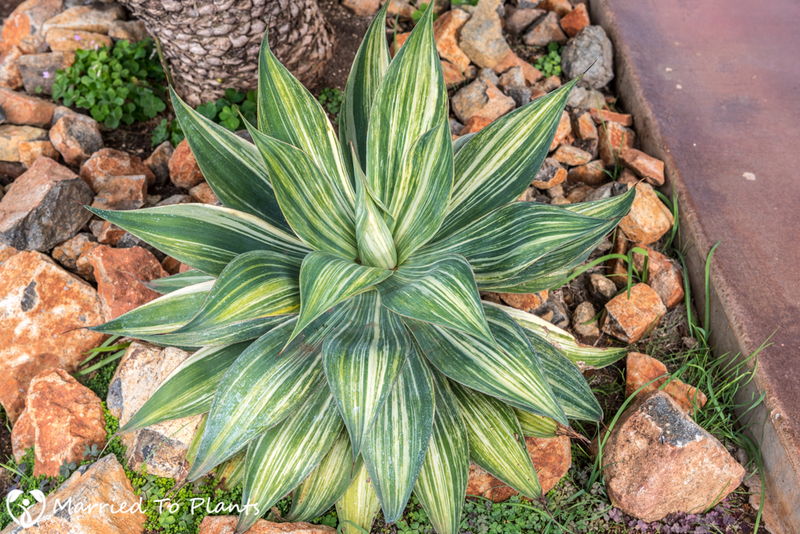 Agave attenuata with half moon variegation. 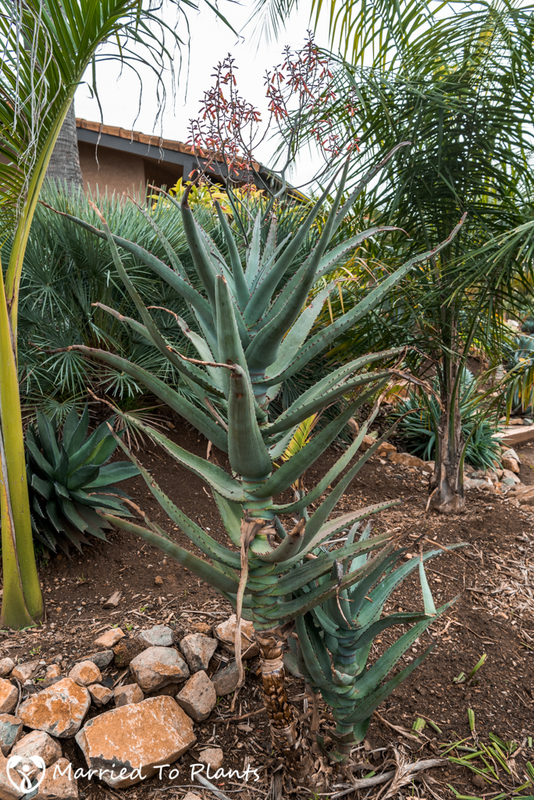 Not all Agave sebastiana are created equal. 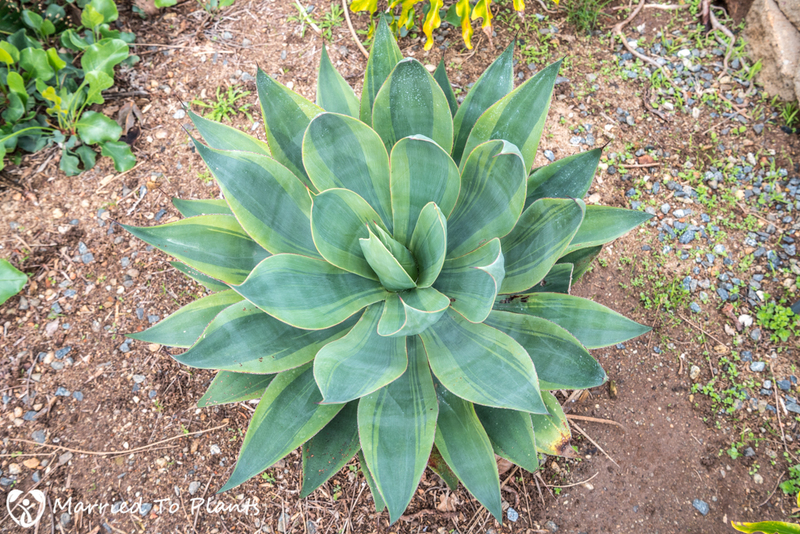 Agave ‘Kissho Kan.’ This guy is ready to flower any day now. 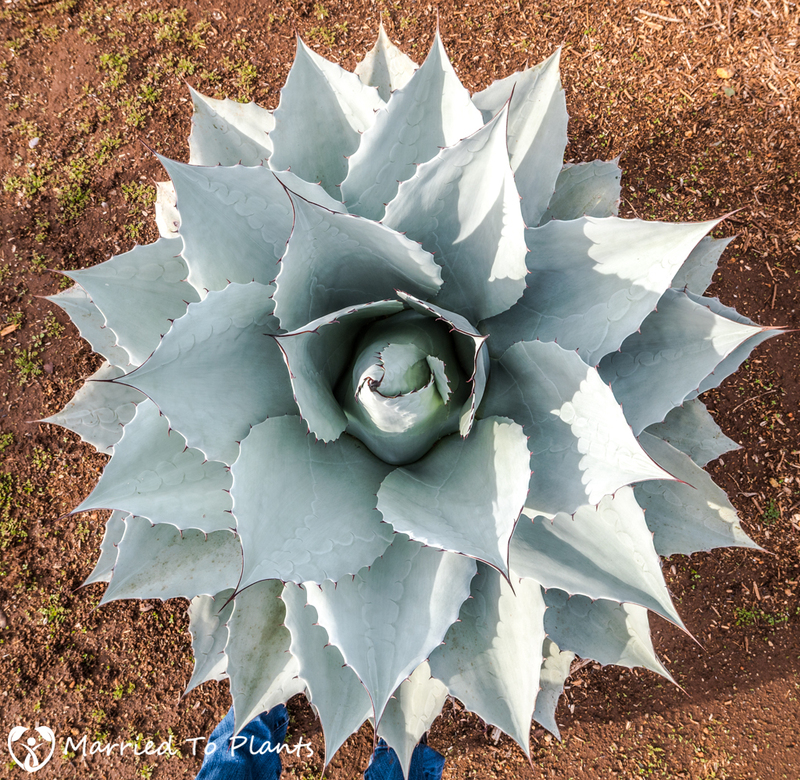 Bird’s eye view of an Agave ovatifolia. Note my legs at the bottom of the photo for scale. 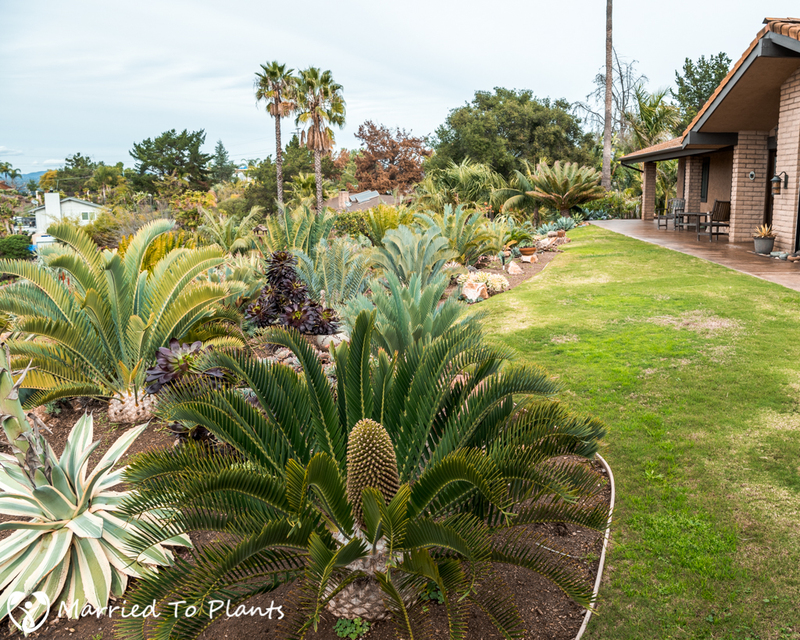 I mainly focused on aloes, agaves and palms for this tour, but Bob has an impressive collection of cycads as well. 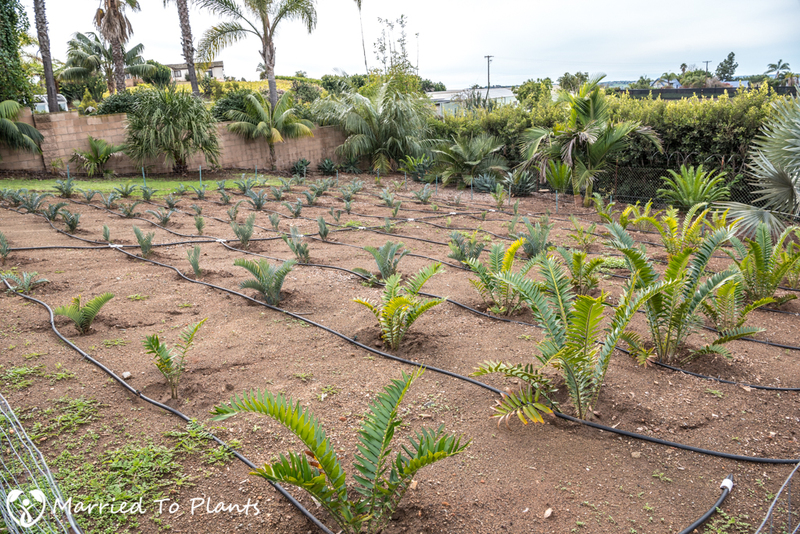 He is even field growing a bunch of Encephalartos for resale down the road. 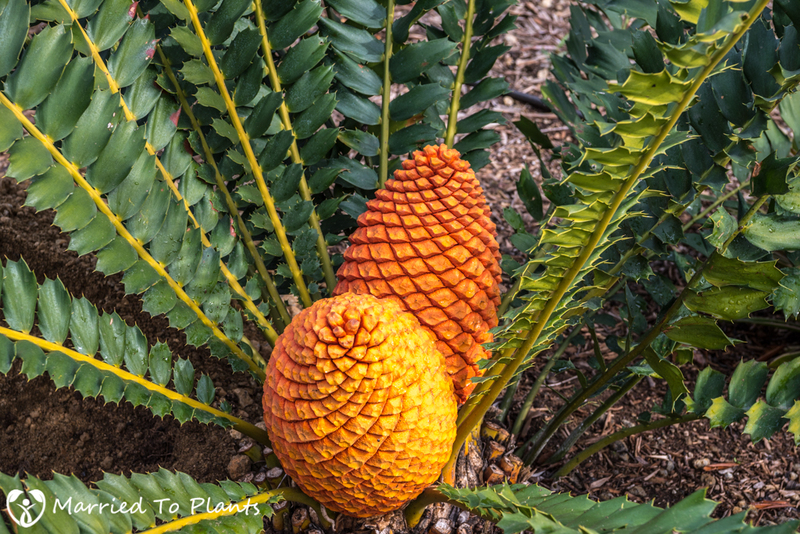 Female cones of an Encephalartos ferox. 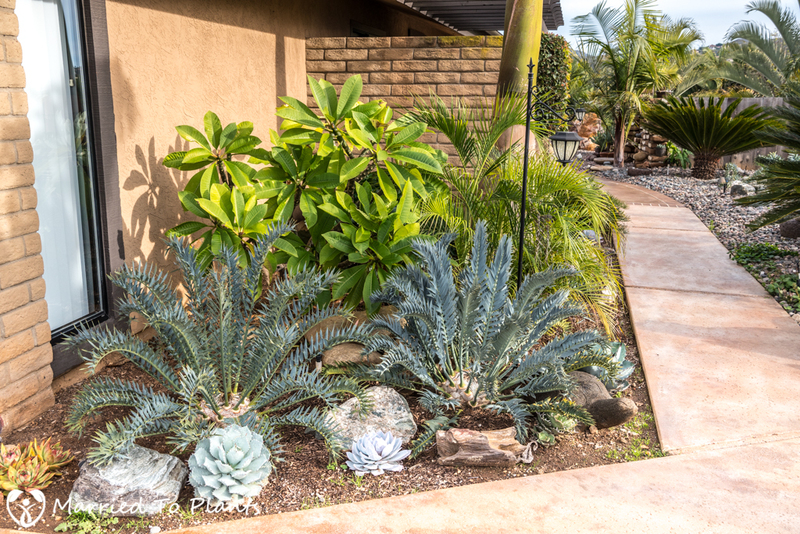 Two Encephalartos horridus with an Echeveria cante centered. 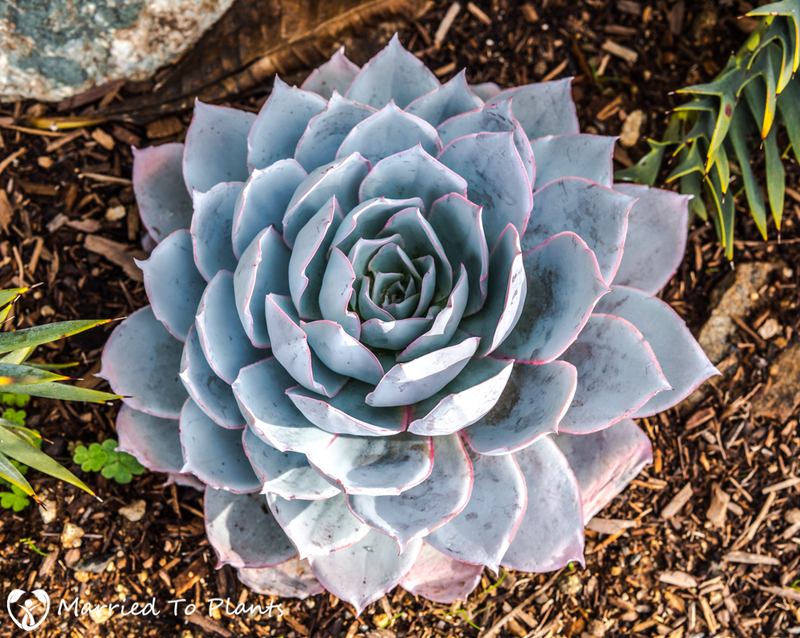 Close up of that Echeveria cante. 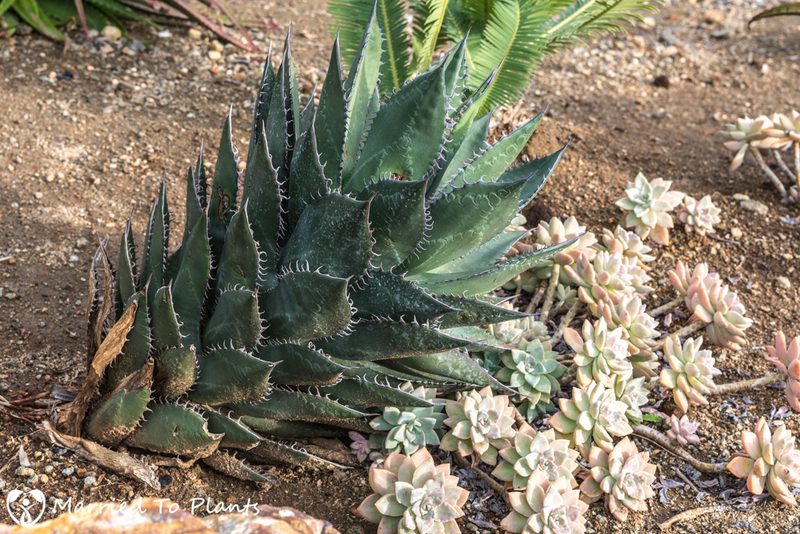 I thought this was a cool shot of a Dudleya hassei. 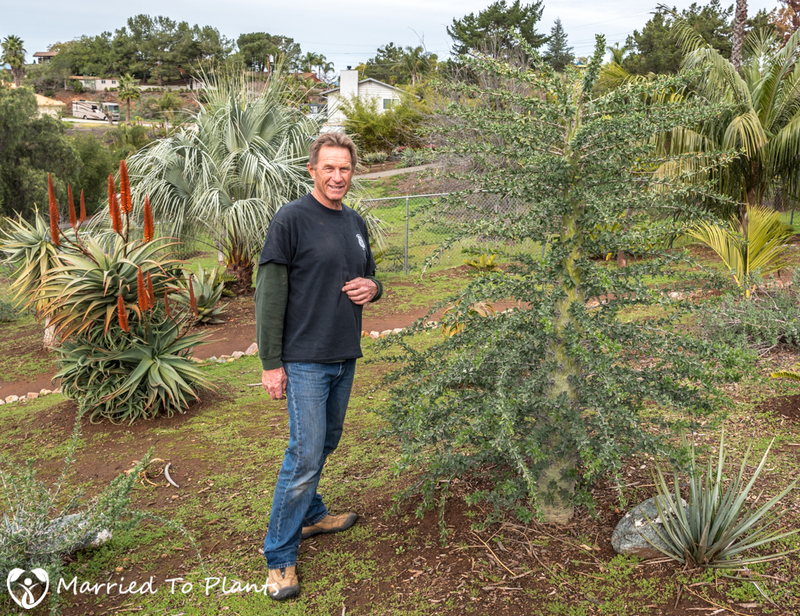 Bob is 6’3″ and used for scale here next to his Boojum tree (Idria columnaris). 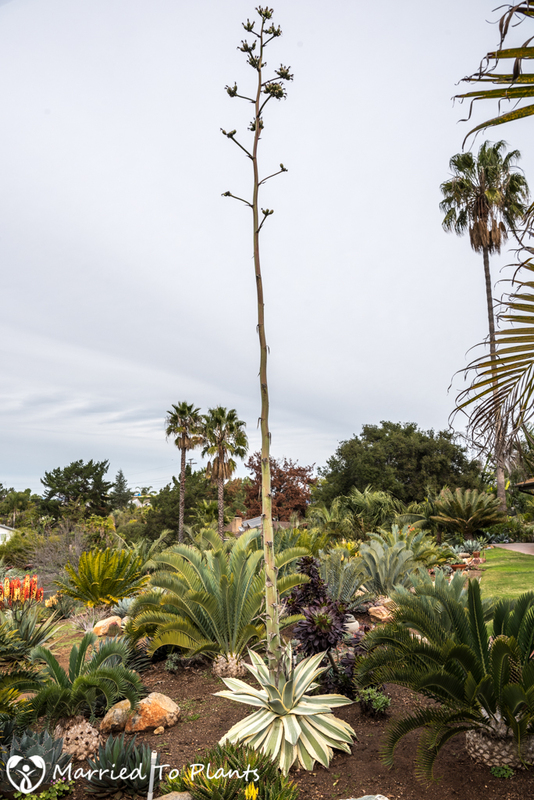 This plant has grown about a foot a year for him. That is fast for this species. 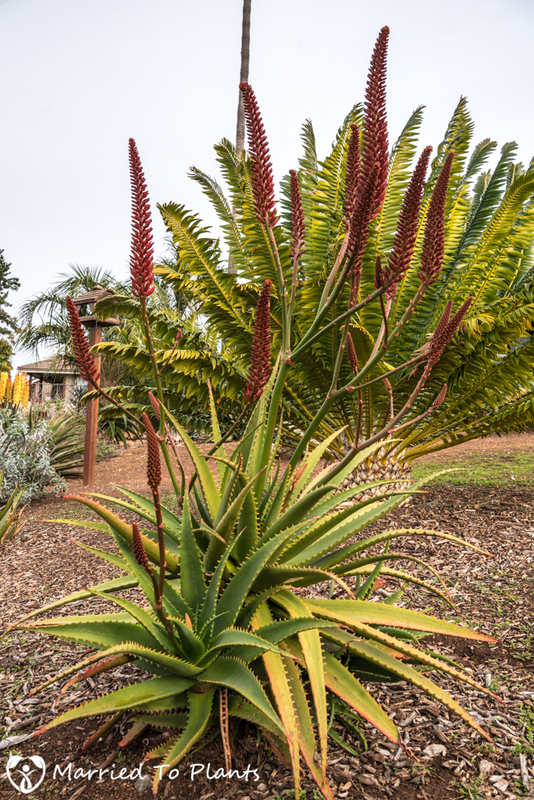 Fouquieria splendens has come alive with all the winter rain we have received. 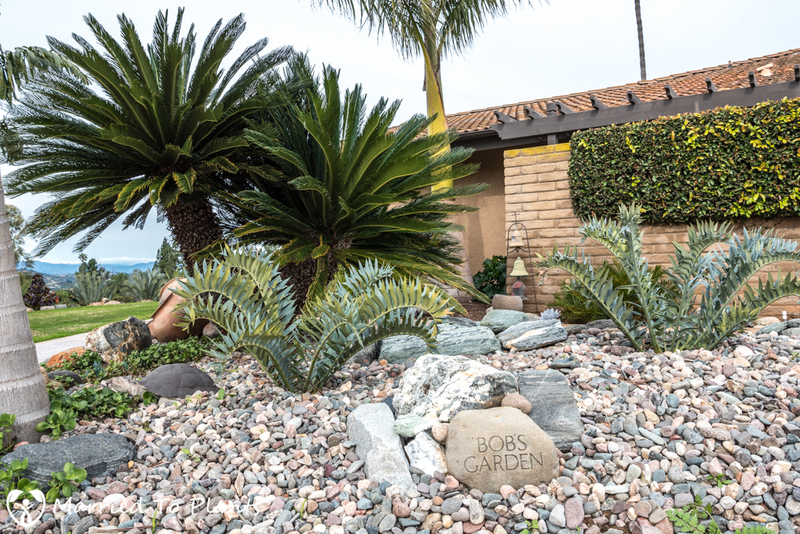 Somewhat in stark contrast, Bob has also landscaped in a more tropical theme to his garden, where palm trees are the focal points. 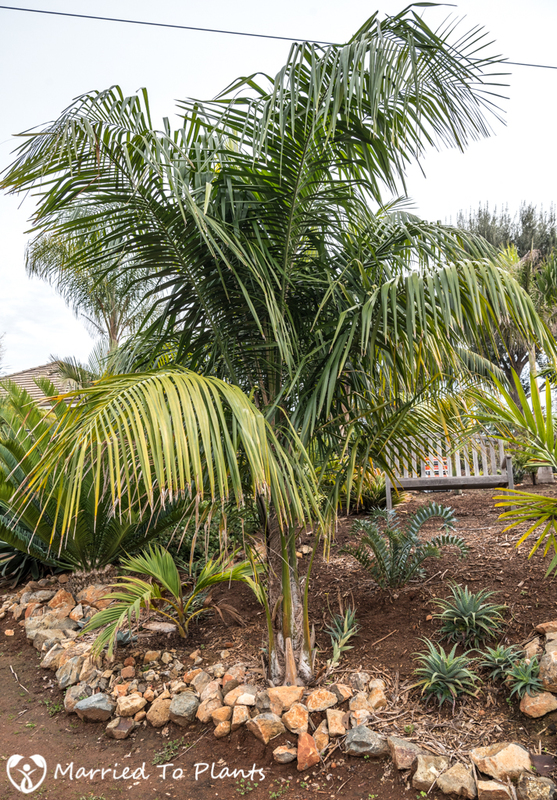 What Mediterranean garden would be complete without a Canary Island Date Palm (Phoenix canariensis)? 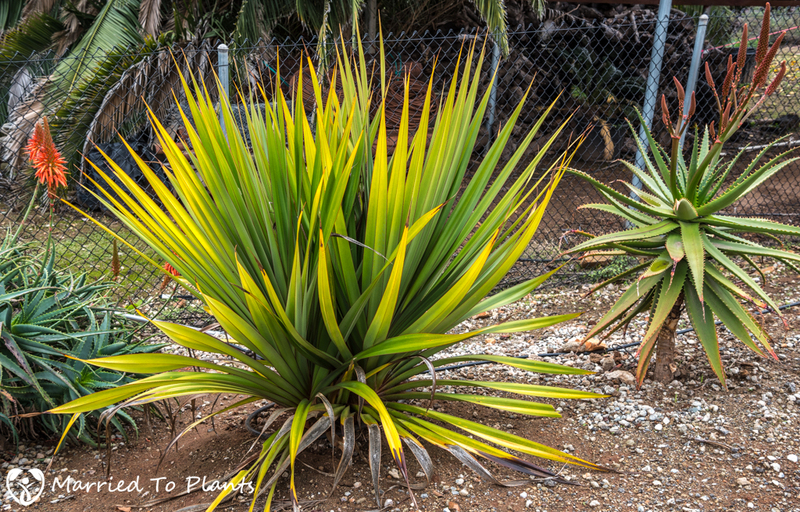 This is one of the few remaining original plantings of the prior owner. 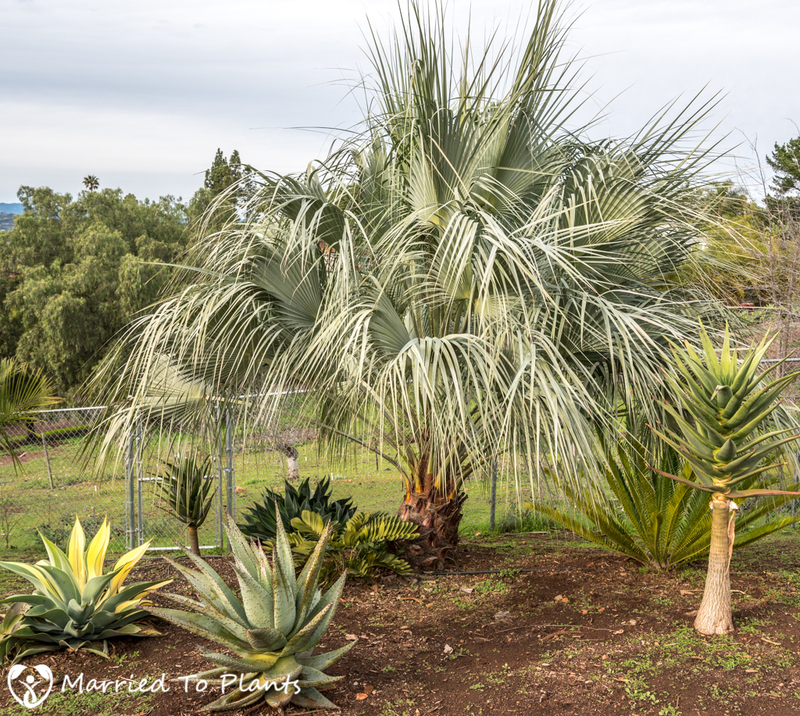 Two native Mexican palm trees. 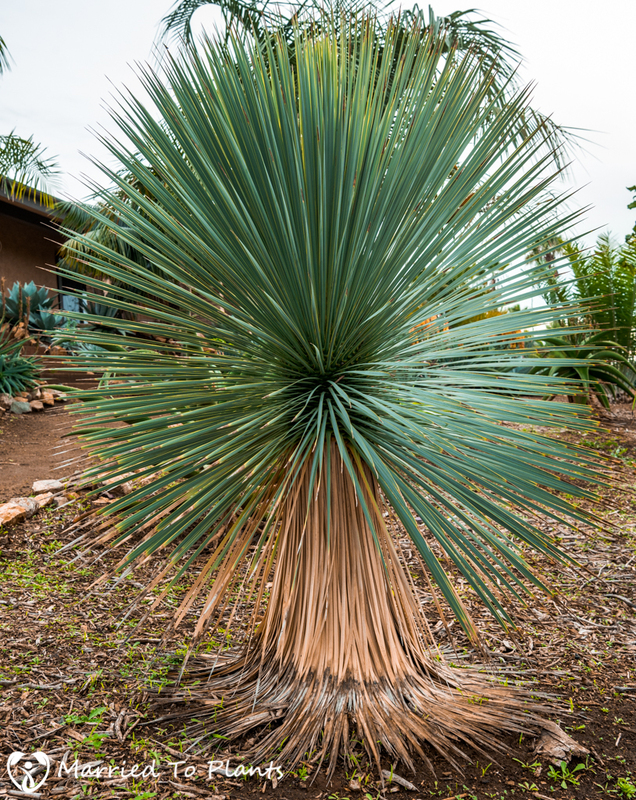 Brahea armata and Brahea armata var. clara. 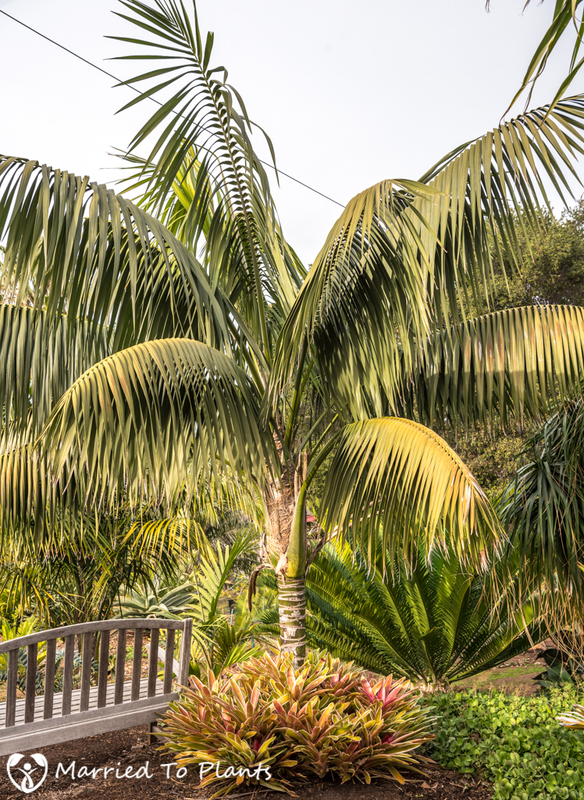 Two native Lord Howe Island palms trees. 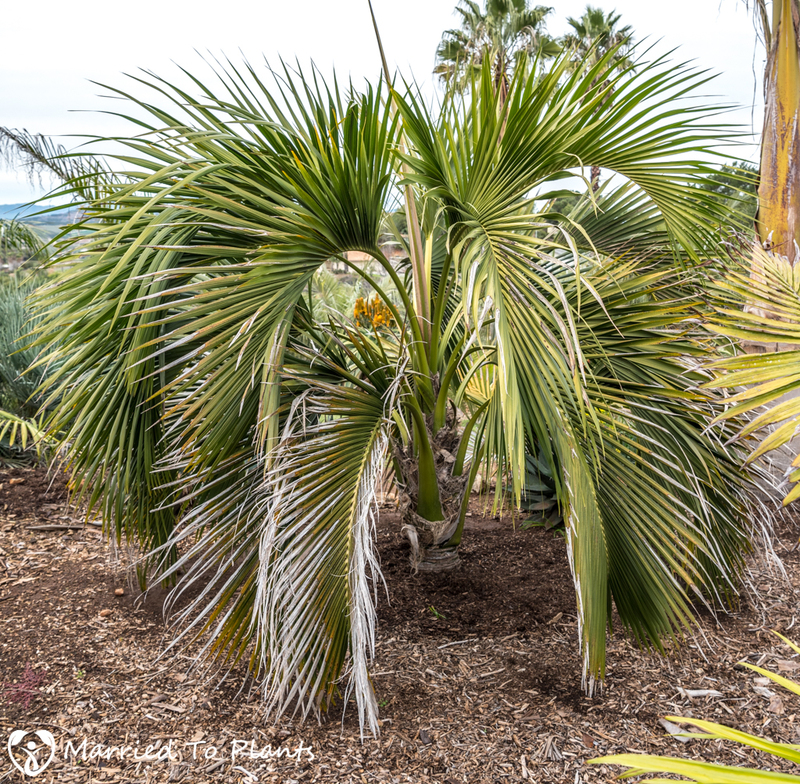 Howea forsteriana and Howea belmoreana. 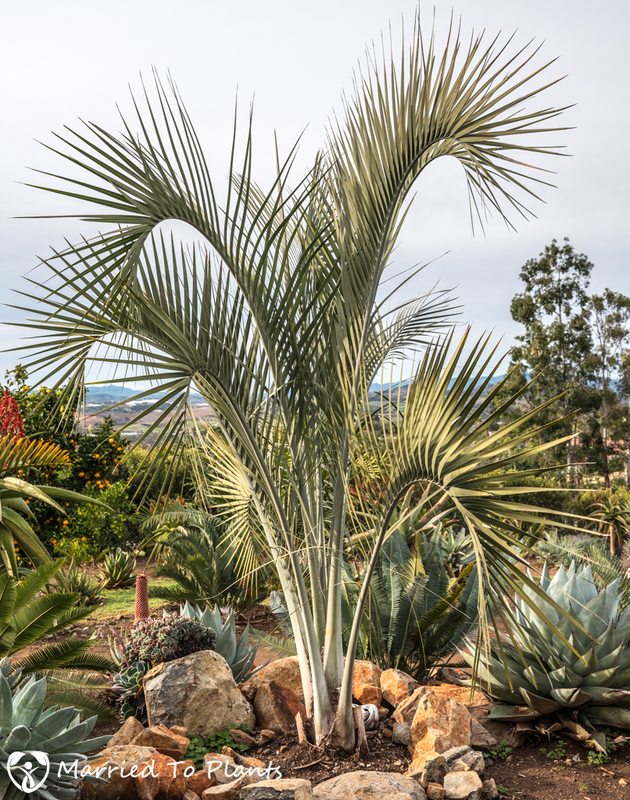 The Howea belmoreana looks really good considering they are not really big fans of full sun. 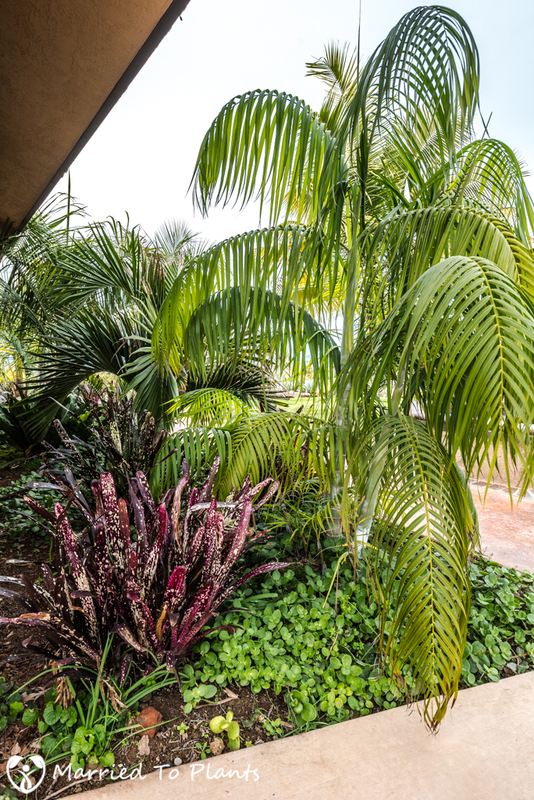 This hybrid Syagrus romanzoffiana x schizophylla was created by Jungle Jack’s – just a short walk from Bob’s house. 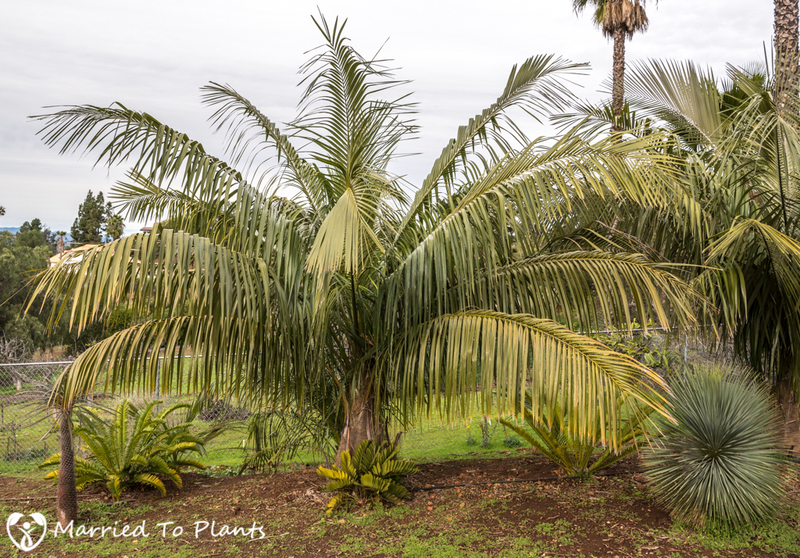 Ravenea xerophila is the perfect companion palm for agaves and aloes. 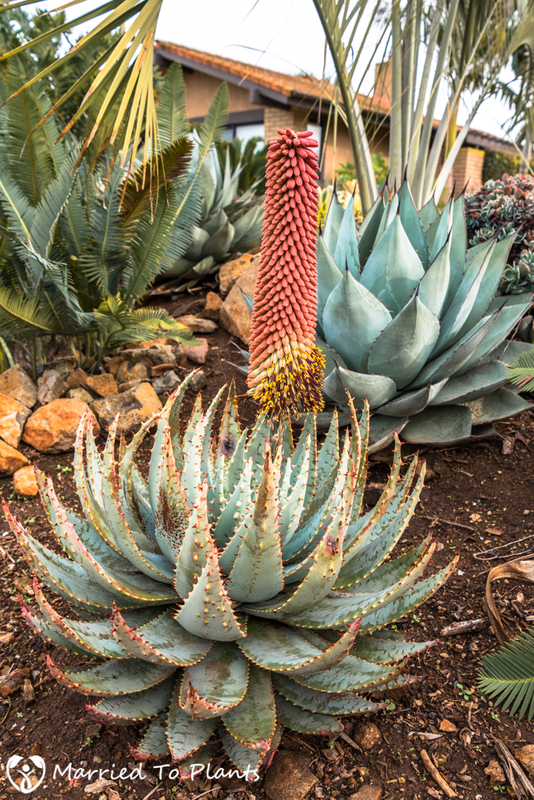 It isn’t just the plants that make Bob’s garden an exceptional garden. 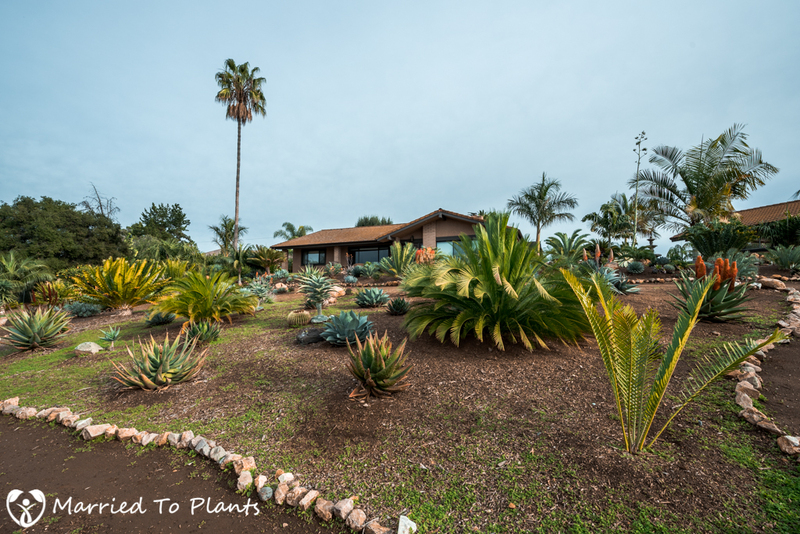 He has done an amazing job of creating unique focal points throughout the one-acre landscape. 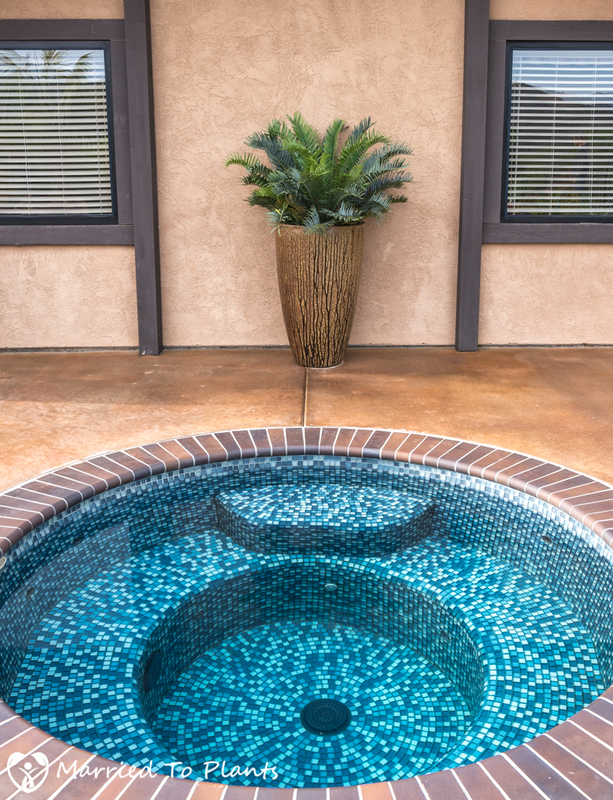 Some are simple things like putting grouped potted plants together where you wouldn’t expect to see them. 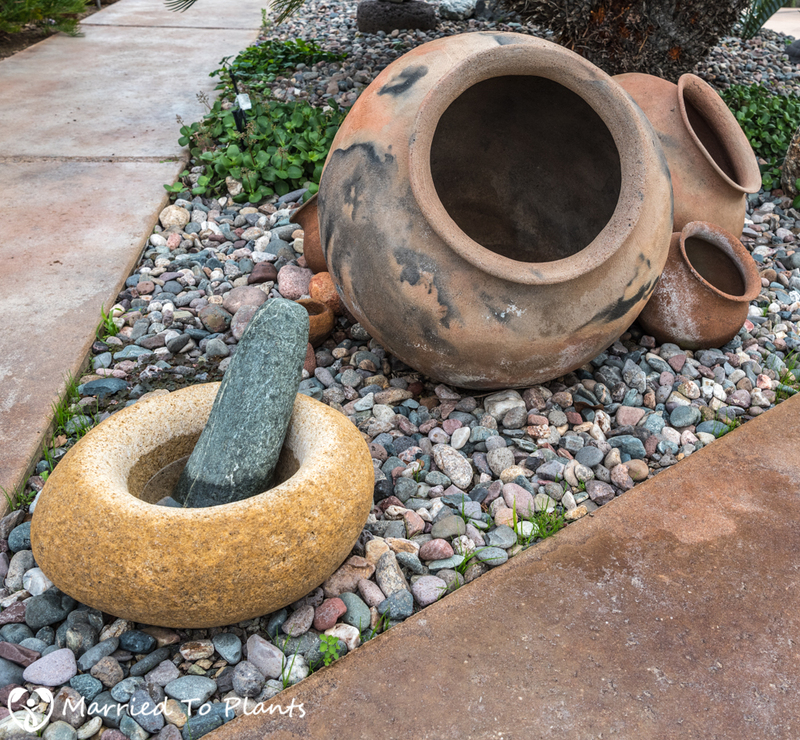 Bob also has an impressive collection of Indian grinding stones and rock bowls scattered throughout his garden. Bob has spent decades collecting these. 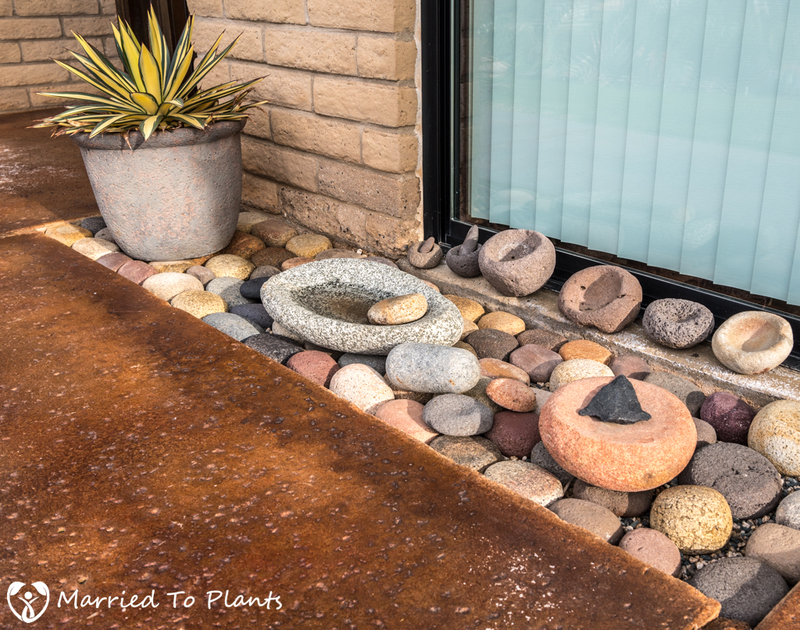 This was my favorite rock bowl. 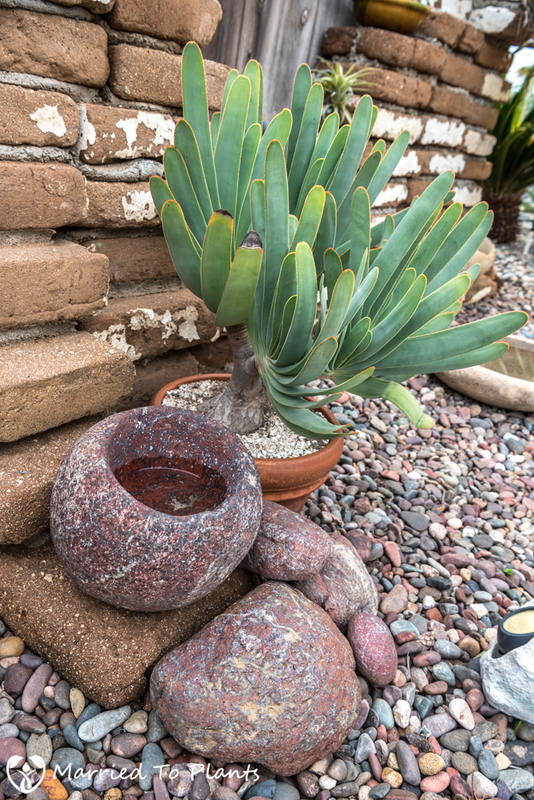 Bob was even lucky enough to find matching rocks to complement it. 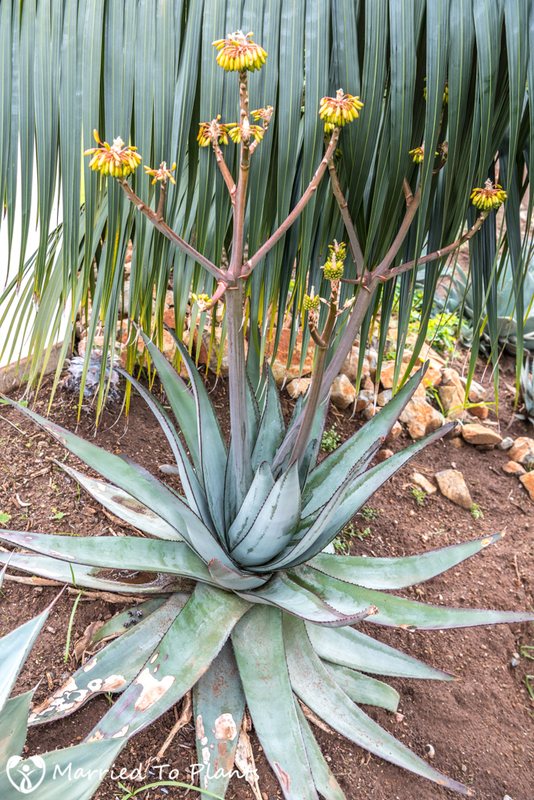 The plant in the pot is an Aloe plicatilis I gave him a few years ago. 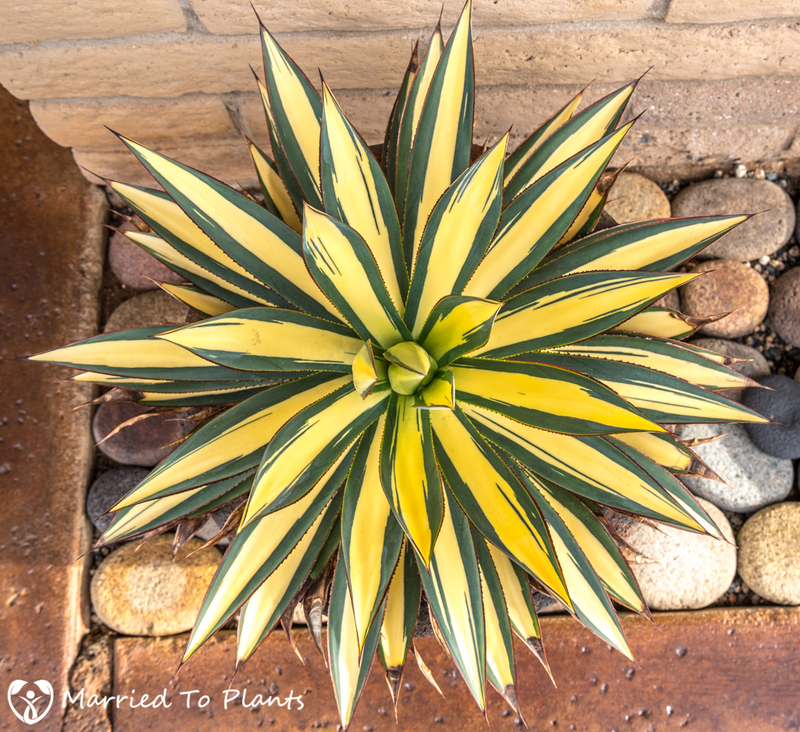 Before I close this garden tour, I wanted to share what I consider my favorite design element in Bob’s yard. 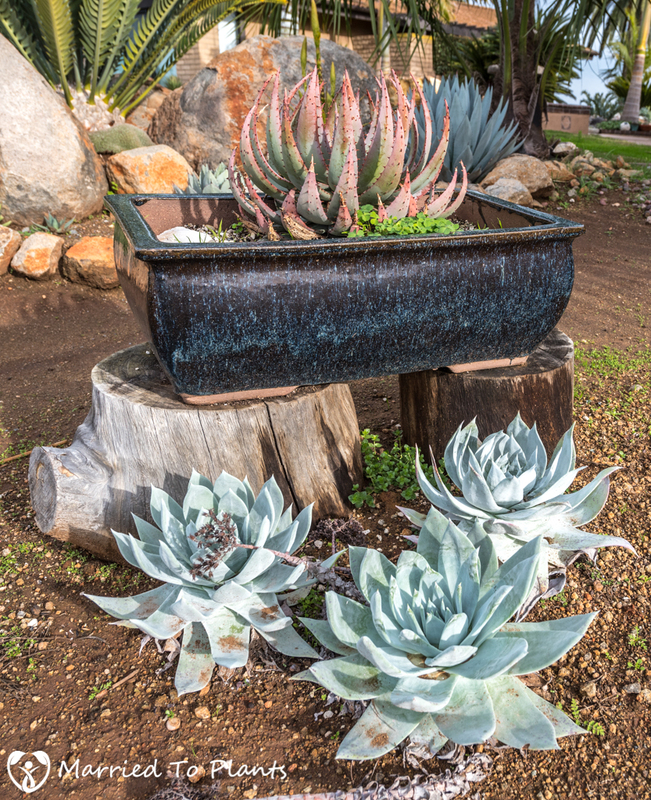 Bob’s wife Jennifer came up with a creative way to hide the spa equipment and propane tank that resides in the middle of his property. 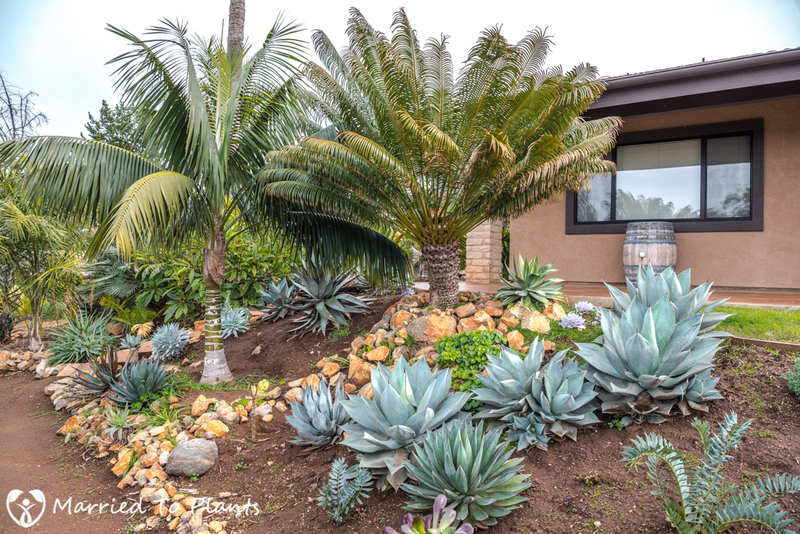 What would typically be an eyesore in someone else’s garden, is a focal point in Bob’s. 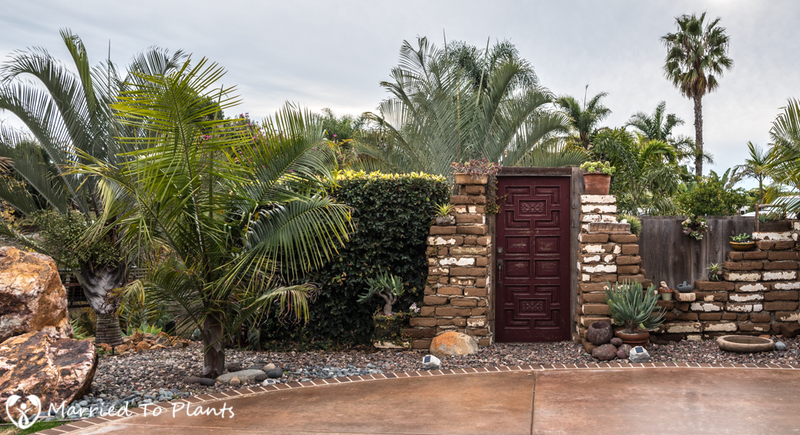 The “gate” is the original front door to the house. 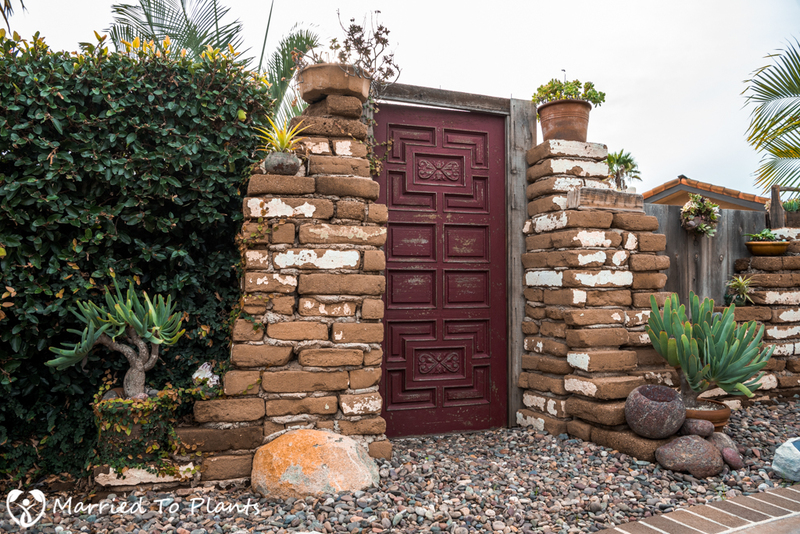 It is accented by old, reclaimed bricks. 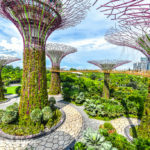 Spectacular!!!!!! Bob is a dedicated artist with the earth! 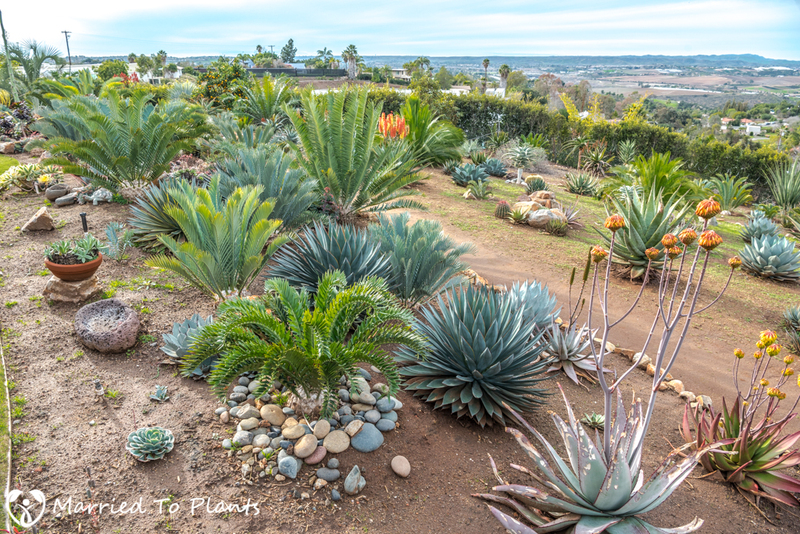 The most impressive collection of Aloes, Agaves, Succulents and plants I’ve ever seen! 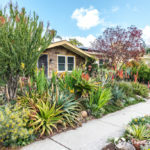 OMG your yard is jar amazing………want to bring a bottle of wine and check it out! !